Evening - check out the room trading. After just 5 hours sleep, I had to get up at about 7am so that I wouldn't miss the Custom Class at 8am. Even though they let in a few people after 8am, they were important people, so if I'd arrived late I wouldn't have gained access to the room. 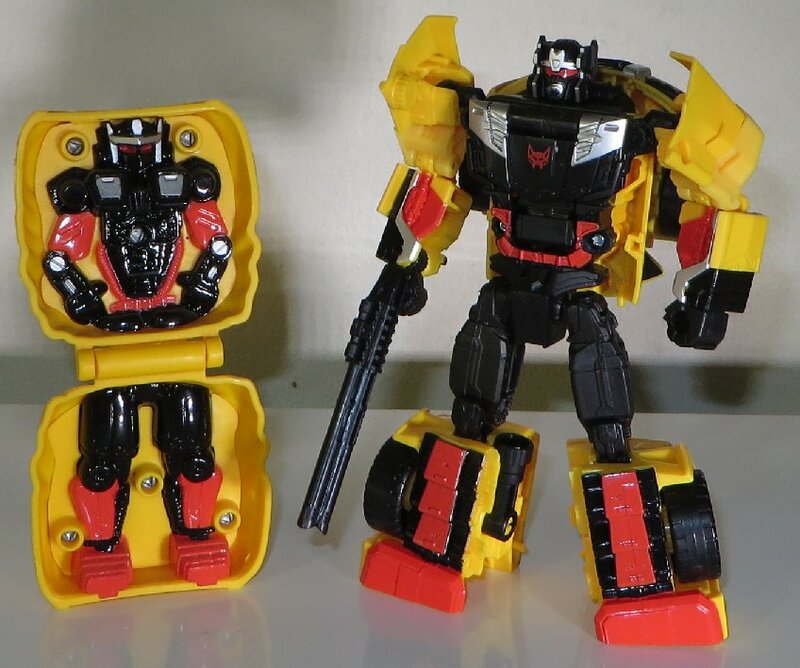 With very little painting to do on the toy, and stickers that I would put on later, I was out of the Custom Class and back to the Room by about 12.30pm. 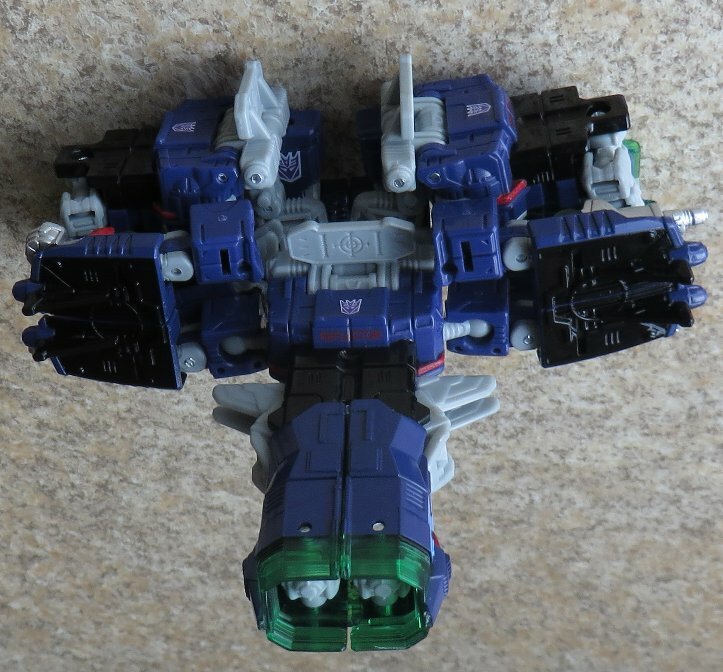 For the next 2 & 1/2 hours I was taking photos and posting on the messageboard, while also deciding if I had enough money to go toy shopping before the Club Store tonight. Doing up the calculations, and a trip to the ATM on the third floor (which only had a $200 limit per withdrawal, with a $3 fee each time), I found that I had about $200 I could spend, which would include the cost of the taxi. 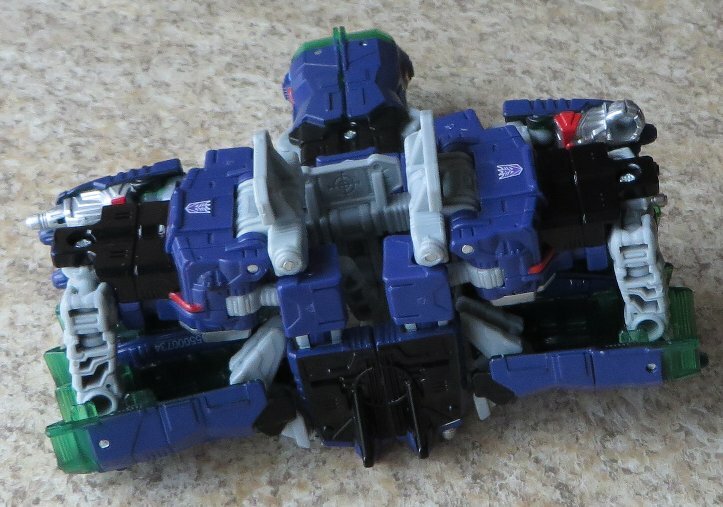 I worked out that I would only have enough for one of the two southern shopping locations, so picked the Jeffereson mall location which had the ToysRUs and Target. 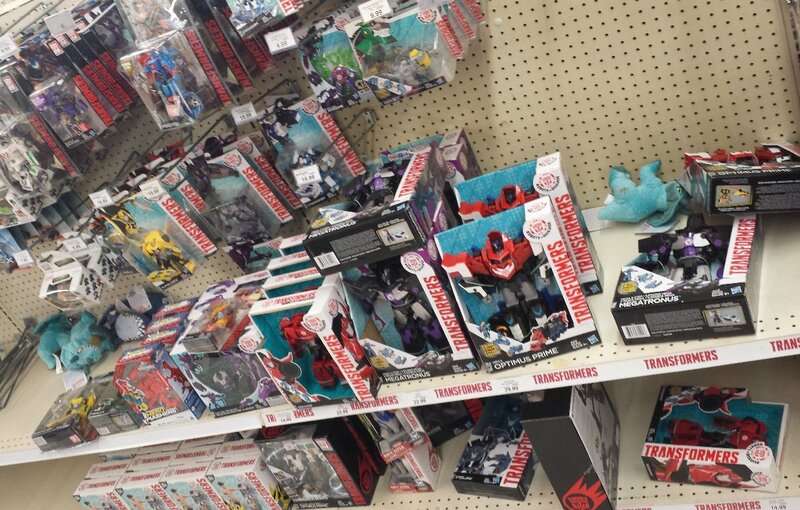 Walmart was the priority because they usually have a large grocery section and slightly cheaper toys, but with Kmart being an unreliable source for toys, I went with the ToysRUs/Target option, as I knew that Target would have grocery food as well, just not as much as Walmart. 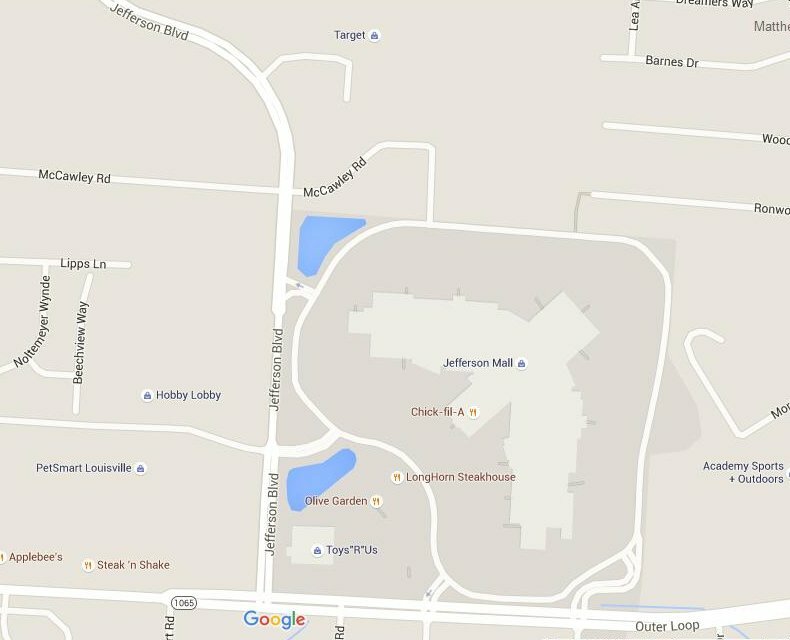 At 3pm I went down to the front of the Hotel and hopped into a taxi, telling the driver what I was wanting to do, and if he knew where the Jefferson Mall was. 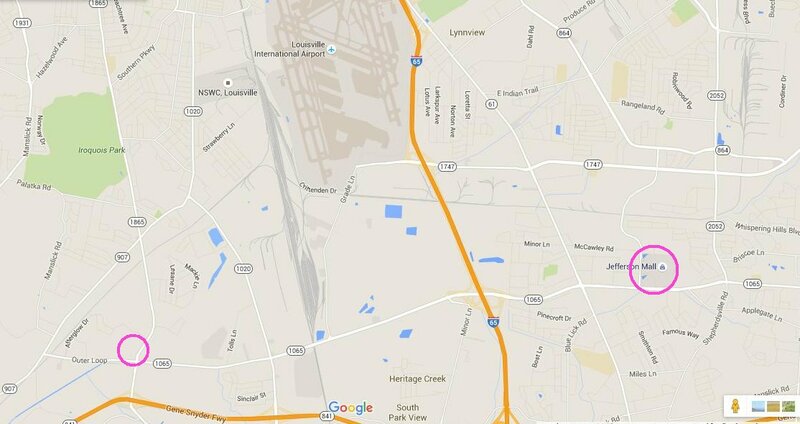 After telling him the direction and road, he knew where it was, and agreed to my plan of stopping at each store and waiting for me. 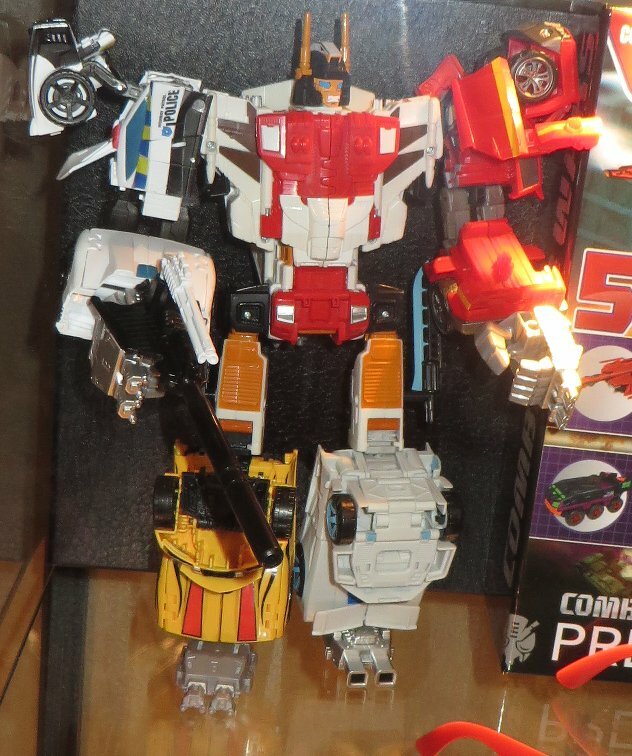 We arrived at the ToysRUs first, and as I went in, the driver said that he had to use the restroom, so wouldn't have the meter running until he got back. 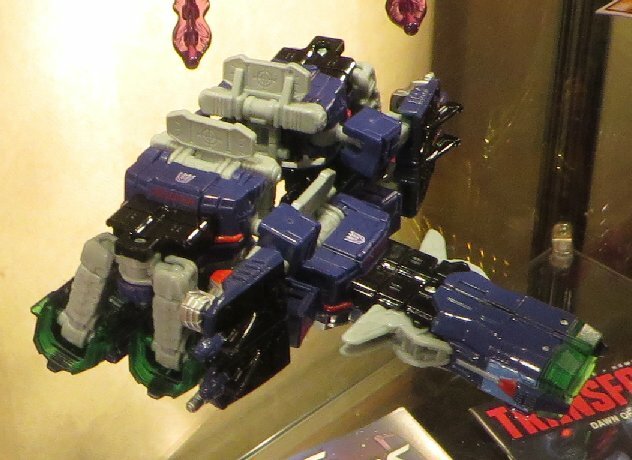 Which was good, because I got back just as he did, with only one toy purchased (Generations Leader Skywarp). 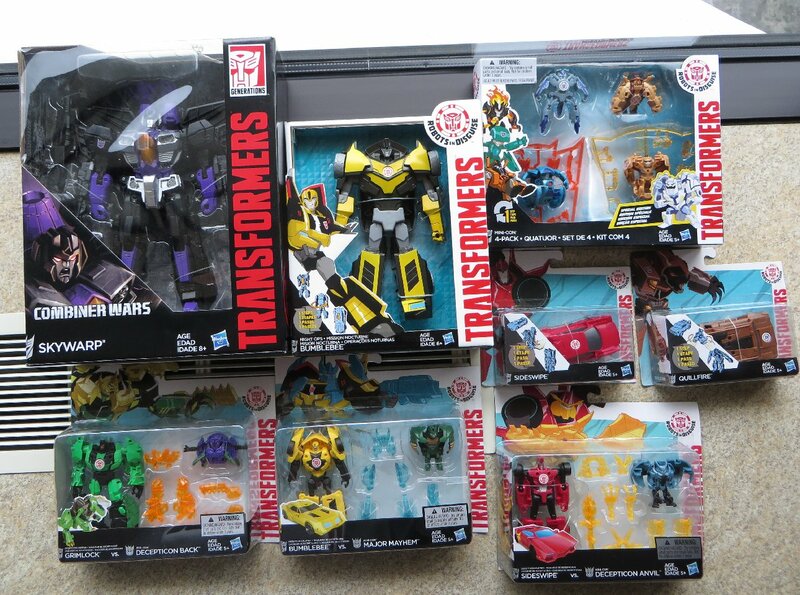 Then it was Target next, which I bought a number of RID toys, including one that I found out later I already had (not the first time I've doubled up on something while doing these mad runs into a store). 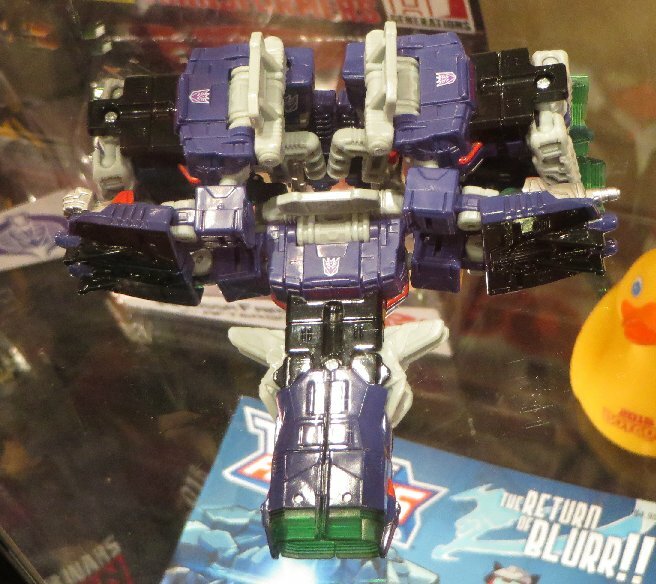 This was at the ToysRUs store, which had a nice selection, but none of the RID Clash exclusives that I wanted. 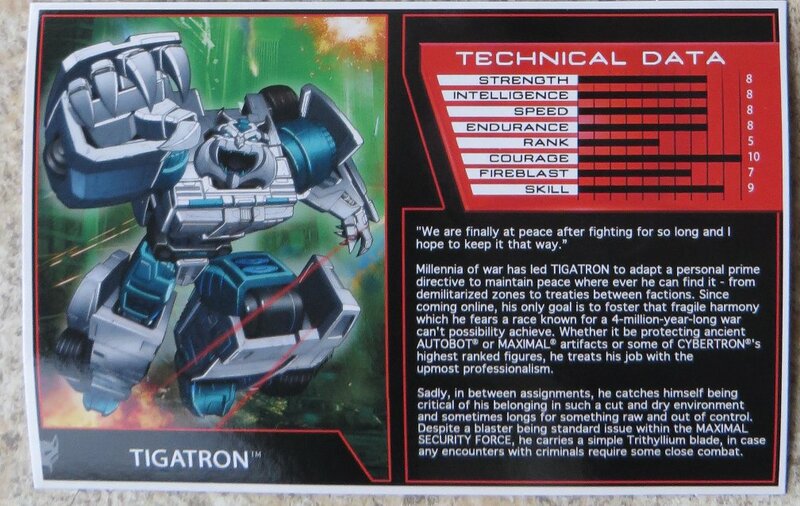 They only had Megatronus, and I already have that one. 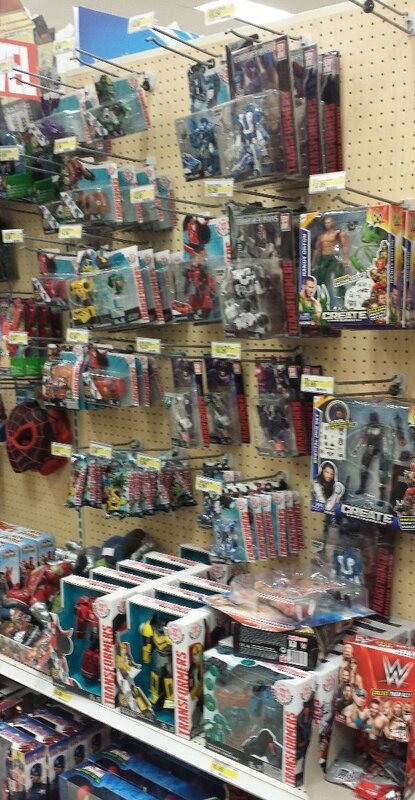 This was at the Target store, which had about as many at TRU, but more of the RID toys, some of which I didn't have. 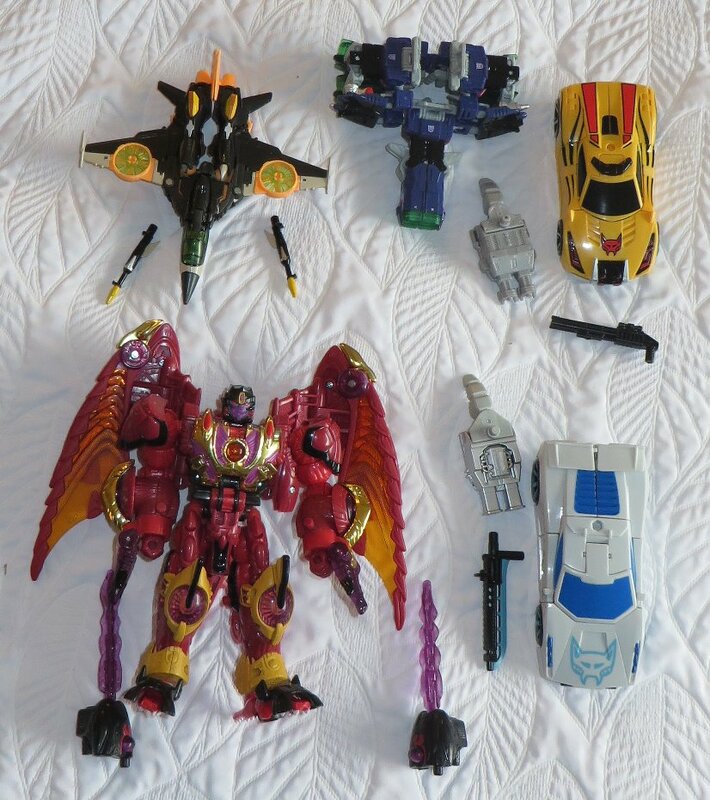 So at least both stores weren't a wasted trip, as I spent $75 on the round trip with the taxi, for $170 of toys. 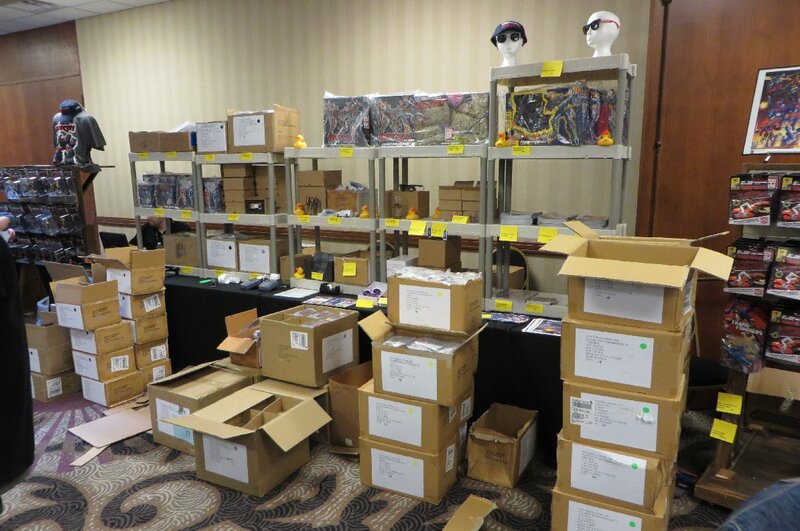 A little over budget, so I didn't end up with much for the Dealer Room that weekend. 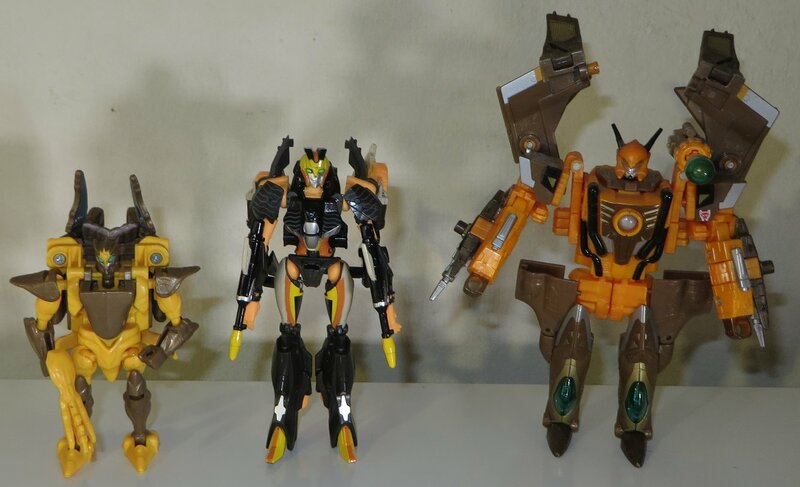 This was the total retail haul for today, with the 3-step black Bumblebee at the top being the accidental double up. 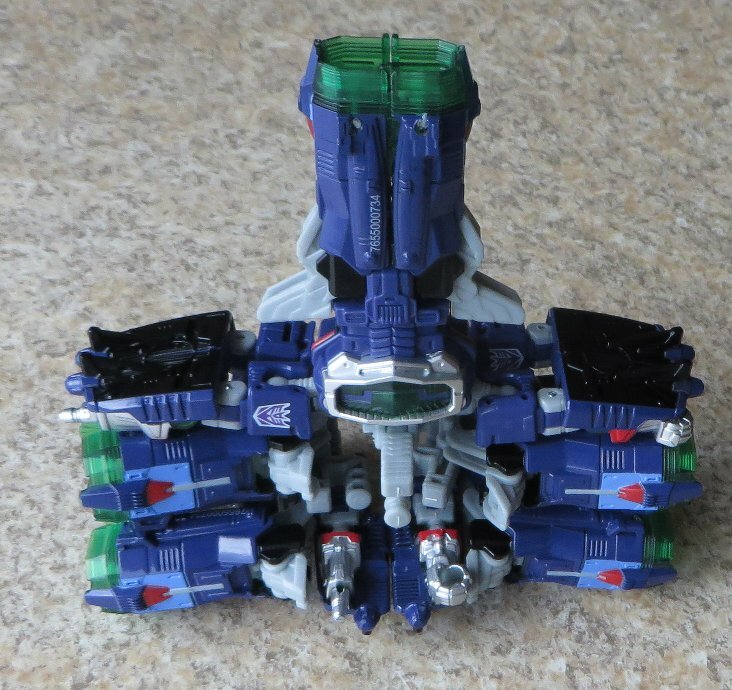 It was such an ugly odd toy that I didn't remember ever buying it. And these were the snacks to last me for most of the weekend. 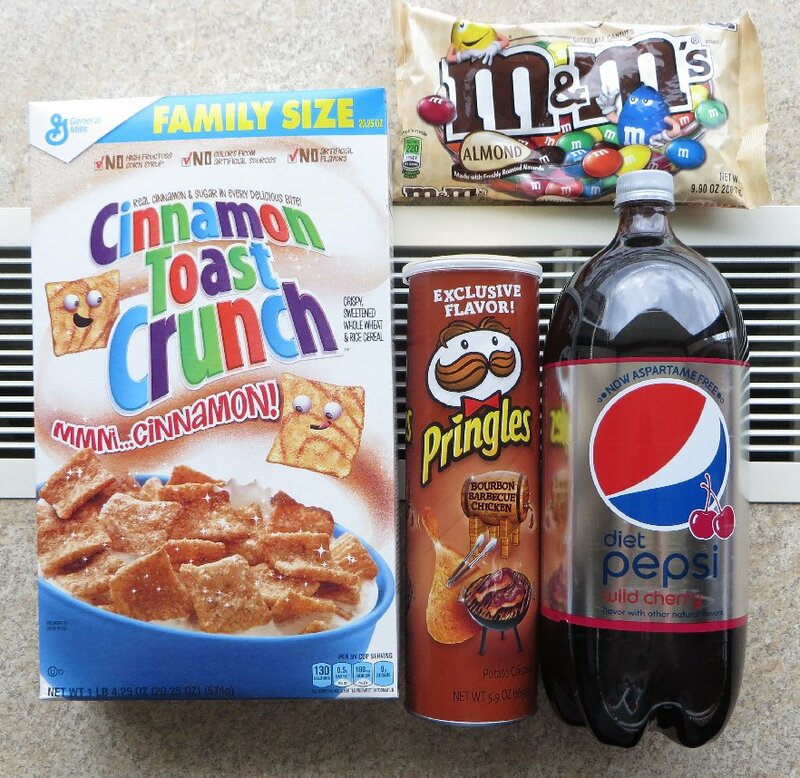 The Cinnamon Toast Crunch cereal is my favourite, as are the Almond M&Ms. The Cherry flavoured Pepsi was bought because we don't have Cherry flavoured cola drinks in Australia, but all the major cola brands in America have it as a regular flavour. It's got a real bite to it like Dr Pepper, so people either really like it or really hate it. 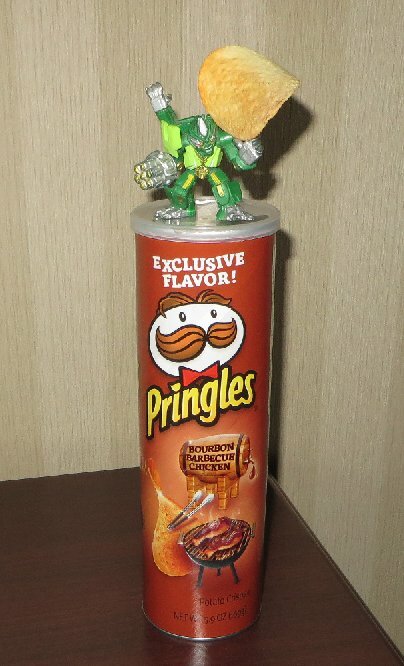 The Pringles were a new flavour that I wanted to try, and because it was a "bourbon" flavour... and Kentucky is home of bourbon... so for someone who doesn't have much interest in drinking anymore, this was a "Kentucky Bourbon" alternative (it didn't have any in the ingredients though). 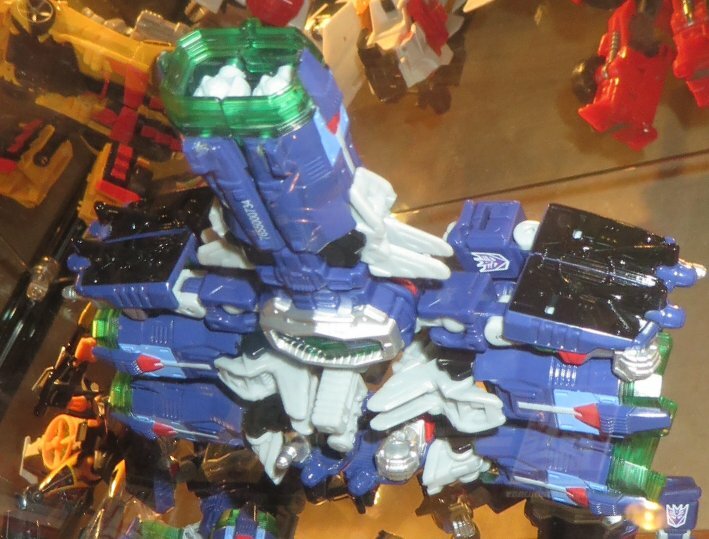 Besides, I couldn't have a drunken Dispensor on the rampage in a foreign city... I'd never be allowed back into the country. The round trip took 50 minutes, so despite it sounding like a huge cost (US$75), it would only take about 20 minutes in an Australian taxi to get to the same amount in Australian dollars. The sun setting outside our window that evening. 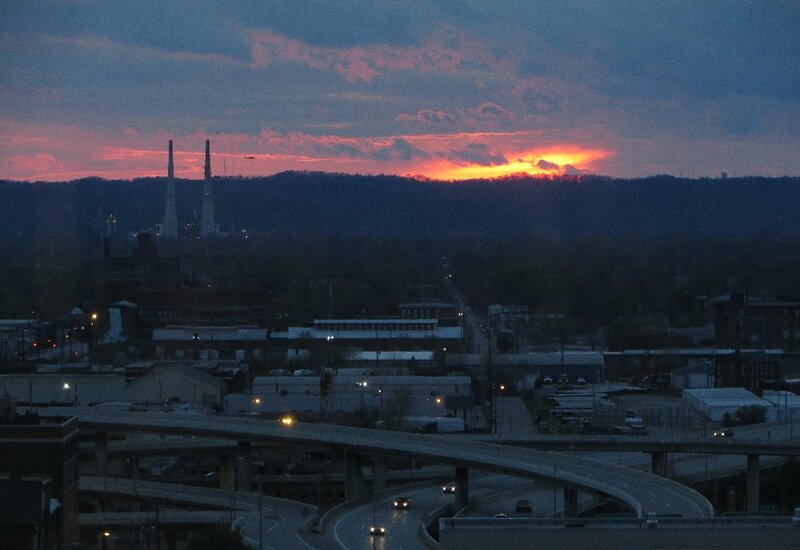 It was the first bit of sunlight I'd seen so far, but it was still partially obscured by clouds. 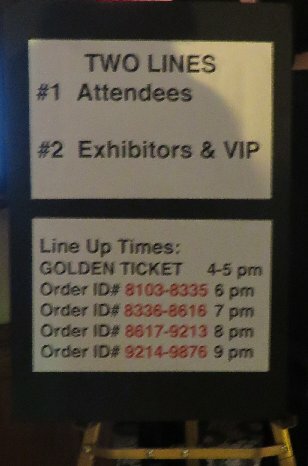 As it approached 5pm I headed across to the main Convention rooms for the Club Store opening for Golden Ticket holders. At the package pickup room there was a sign up for the different group times of the people who didn't get their items yesterday evening. Andy was in the final group of the night so didn't need to be there until 9pm, and wouldn't be at the Club Store until about 10pm. At the Exhibit Hall it was just like last night - I was there before they started letting people in, but it looked like everyone else with Golden Tickets was already there. 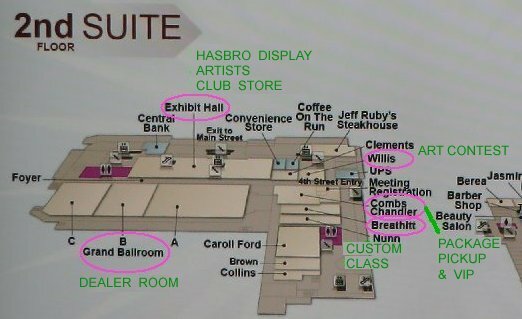 Just after 5pm an announcement was made that they were having trouble with the Credit Card machines, so the people with cash would have to go through first, which was fine by me as I had been accumulating the cash from the ATM and from Andy for his half of the room cost. 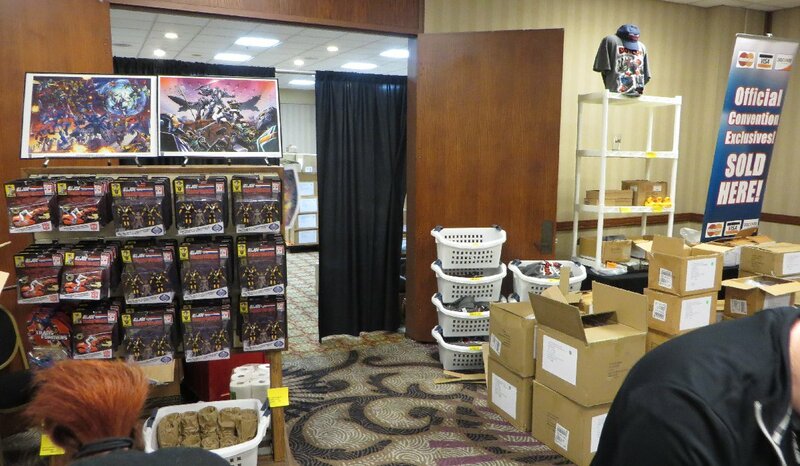 Over by the wall in the photo above was a cabinet with a black cloth over it, which was later removed to reveal the exclusive items for this year. 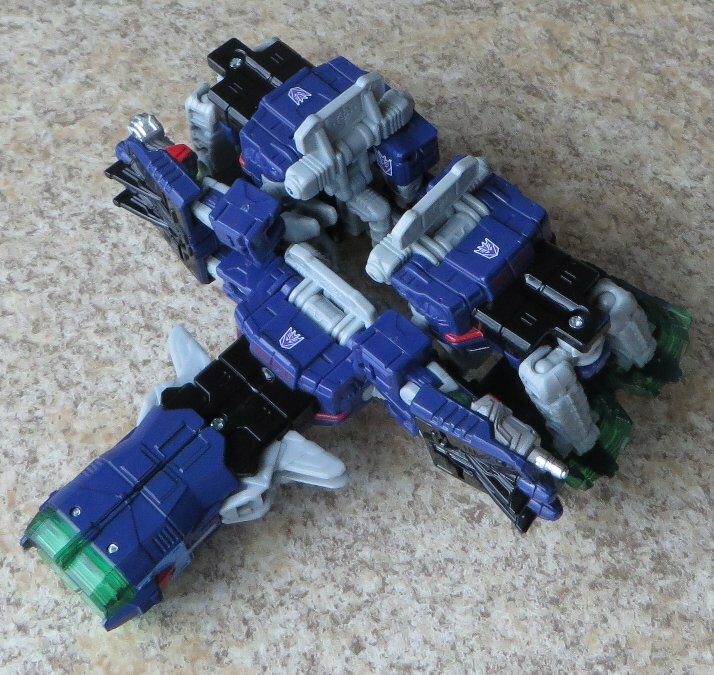 The same ten toys from above, in their separate forms. 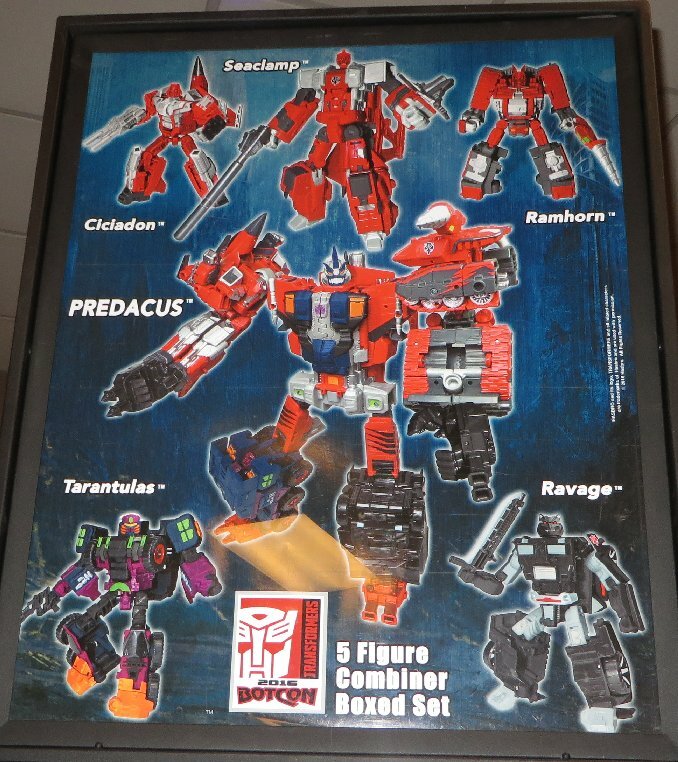 Terrorsaur, Airazor, Reflectors, and Megatron. 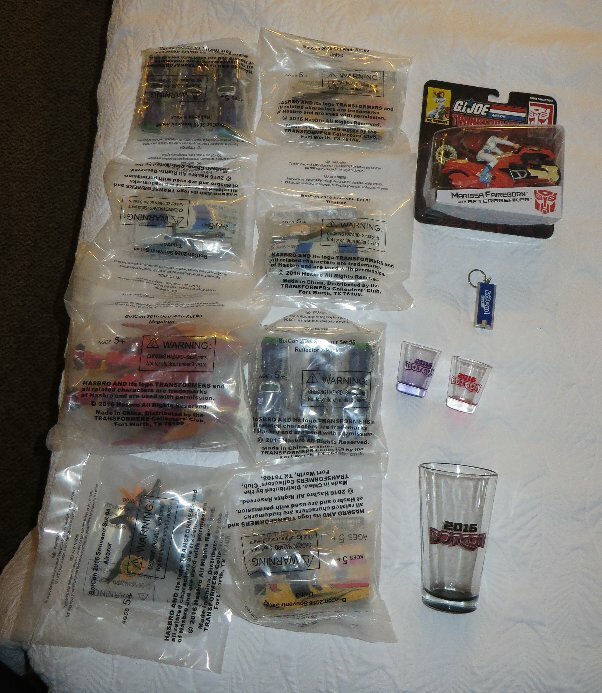 Other items at the store, including their unsold exclusives from last year. 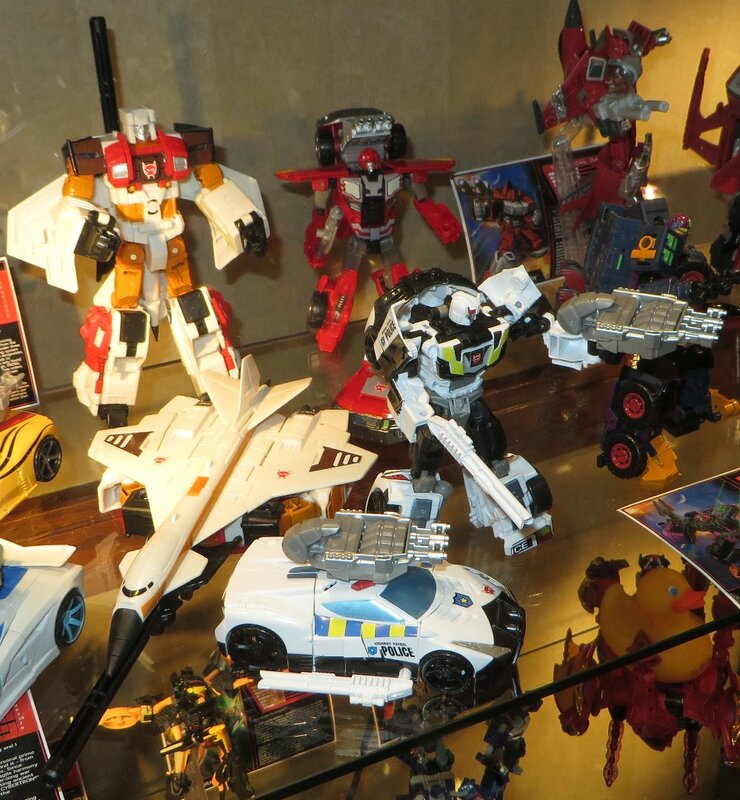 Some close up photos of the toys on display. 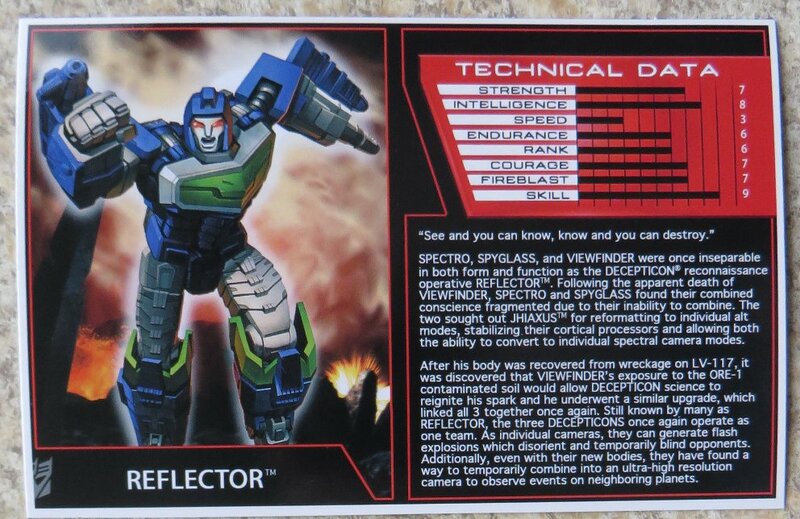 Reflector 3-pack in a "combined" form, by joining up the arms of the toys like a circular chain. 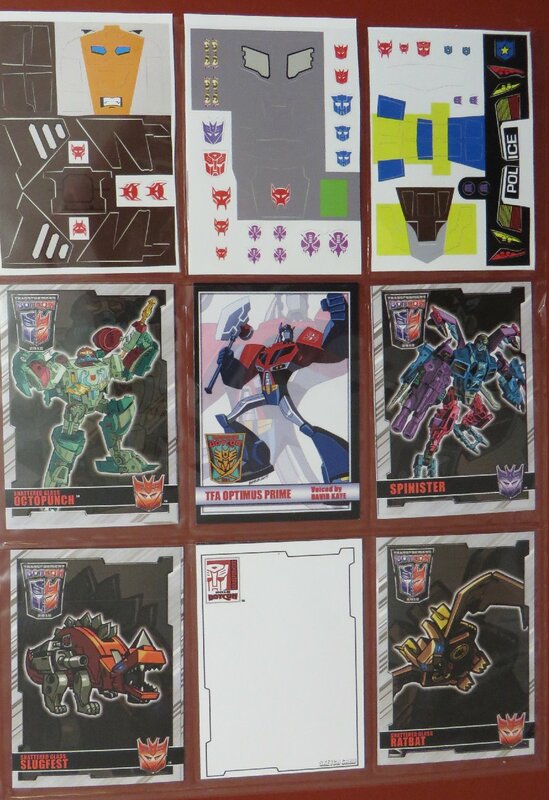 I took a heap of photos for people to use as a reference guide if they got these. 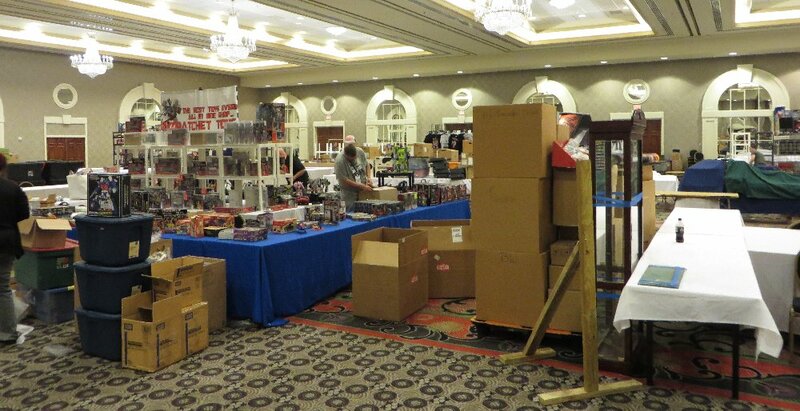 Inside the Exhibit Hall where the Club Store was located, we saw the Hasbro people setting up for tomorrow. 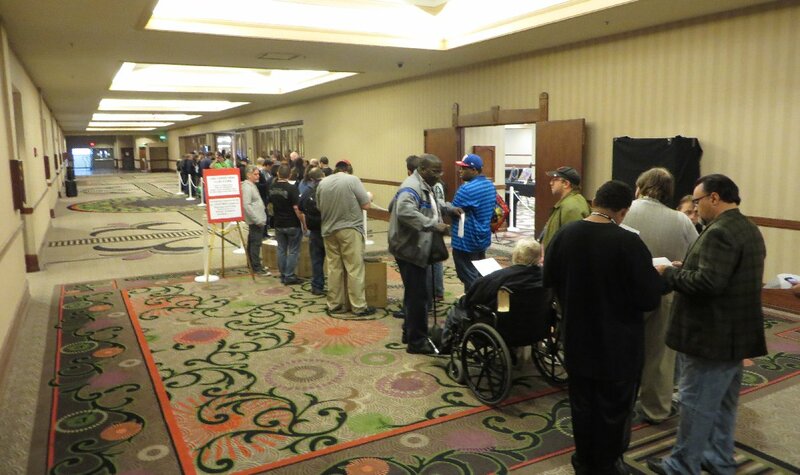 The line to the Club Store. 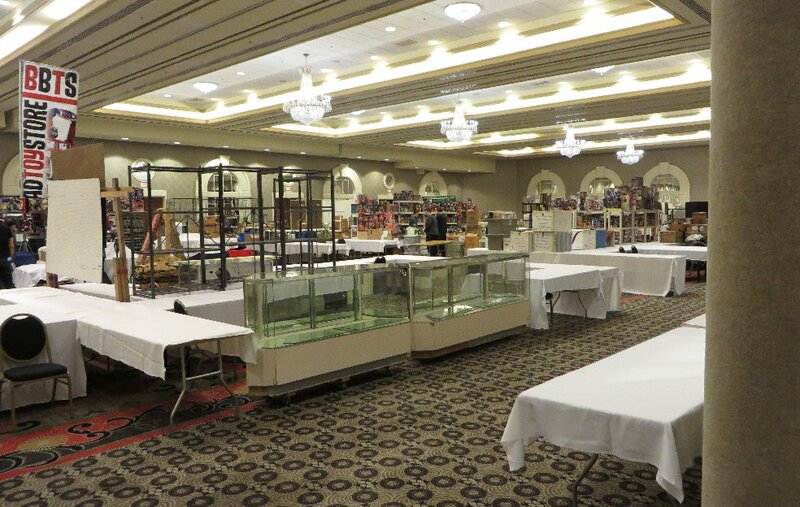 Along one side were tables with details and prices of the items for sale this year. 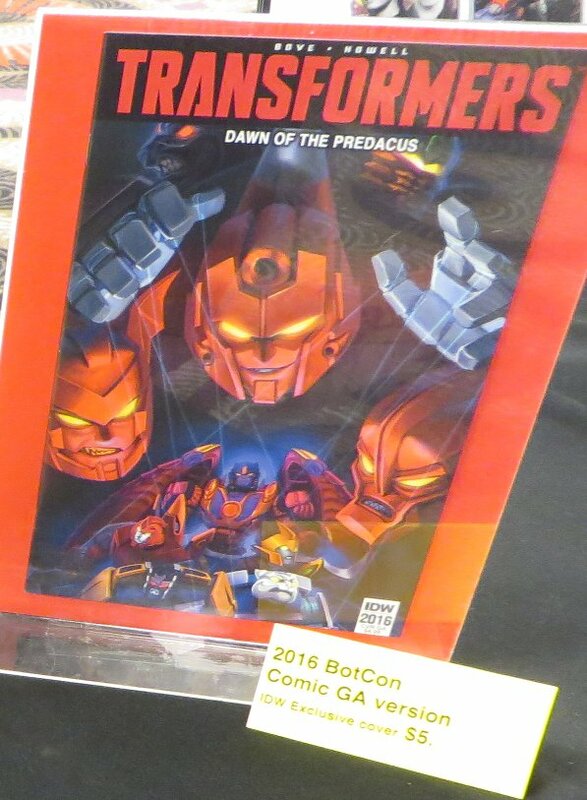 The alternate cover version of the Convention Comic. 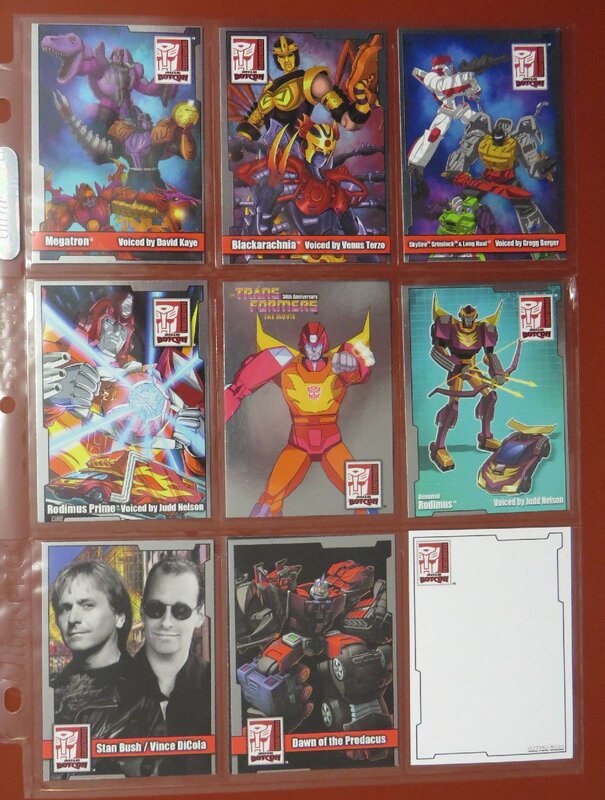 Autograph cards and the Magnaboss stickers. 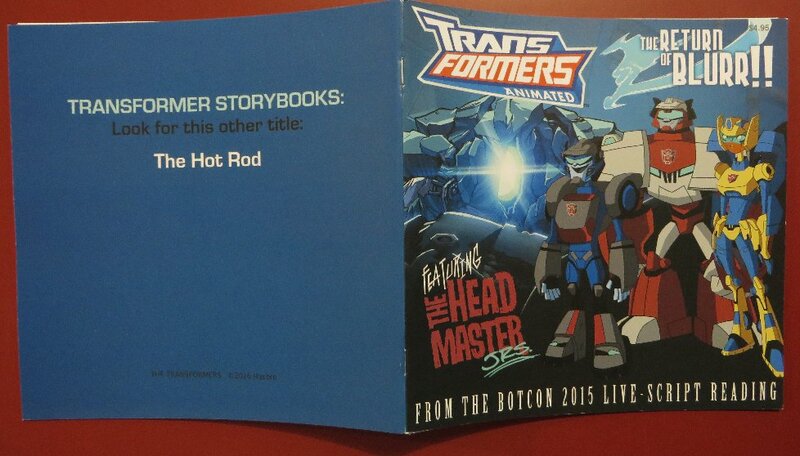 The Blurr book is a printing of the script reading story from last year, while the Timelines story is a continuation of the BotCon 2013 Machine Wars comic. 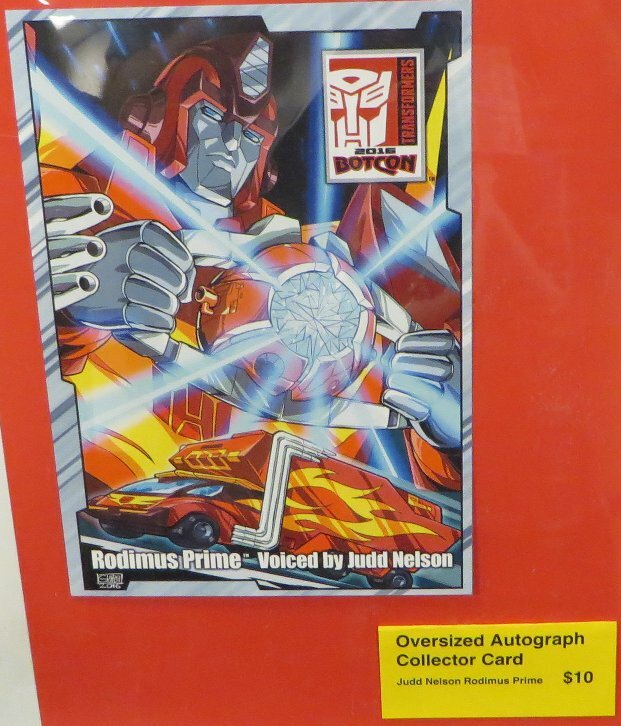 This would have been for Judd Nelson, but the VIP pack comes with a print, so this was probably more for the Rodimus Prime fans. 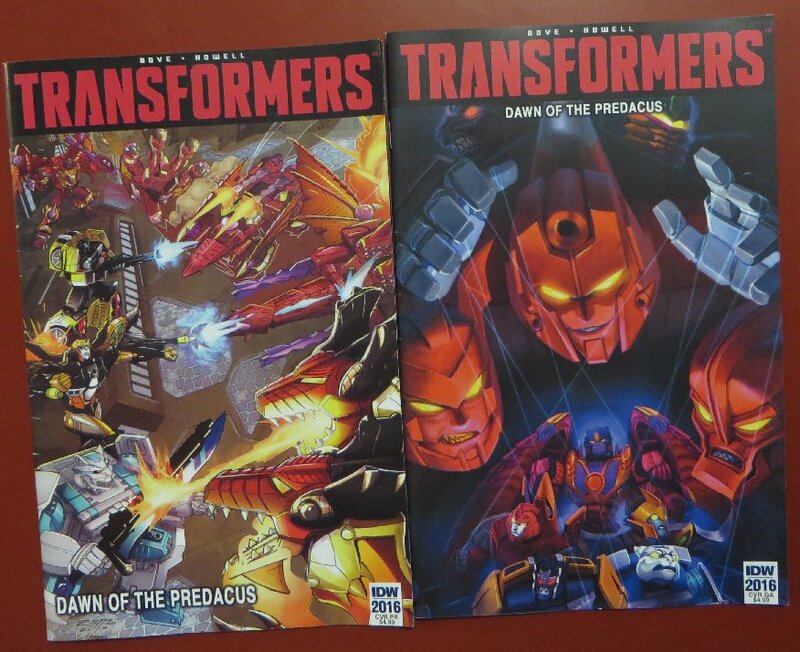 Up next were the four litho posters for this year. 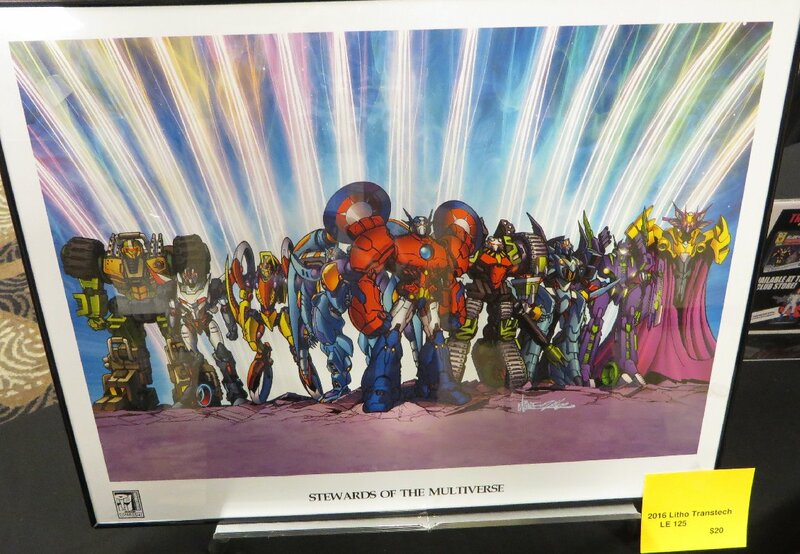 I have bought the posters on each previous year I have attended, but with four this year, I wasn't interested in getting all four (at $20 each), so I decided that I would only buy one. 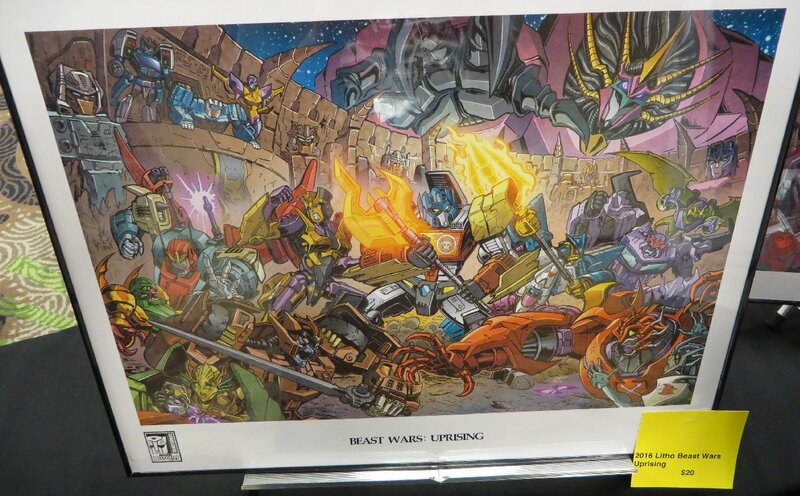 But when I saw the four, none of them related to BotCon 2016, so I didn't get any of them. 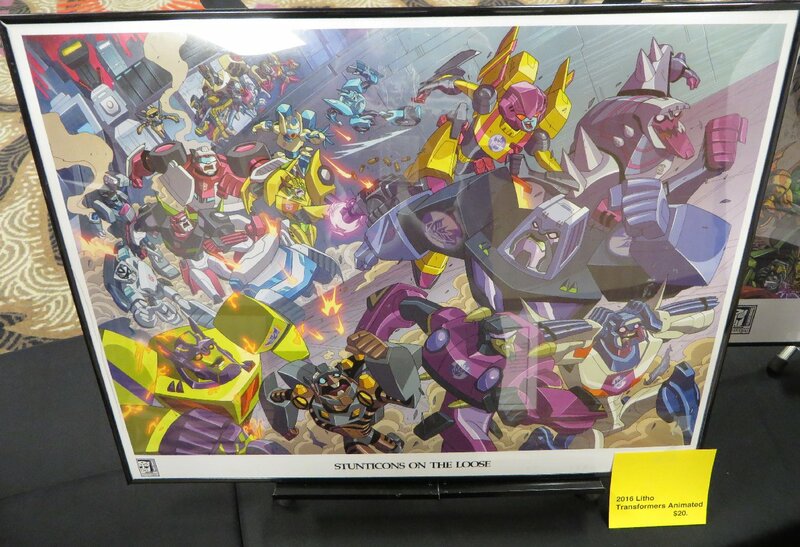 This was an Animated poster, which was the one I liked most, but it relates to the 2010 and 2015 BotCons, and if I was to get a BotCon 2016 poster it had to relate to BotCon 2016. 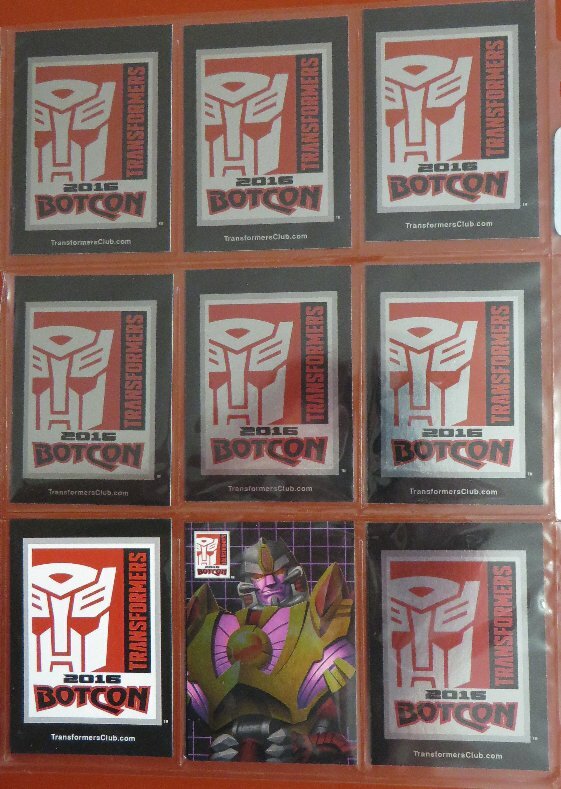 This one relates to the 2015 Club Magazine comic, so was not only about obscure characters, but was also not a BotCon 2016 themed poster. 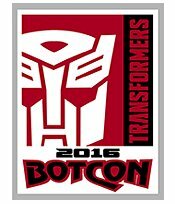 This third one relates more to the Club Magazine comic from 2014 and BotCon 2012, so again was not related to BotCon 2016. 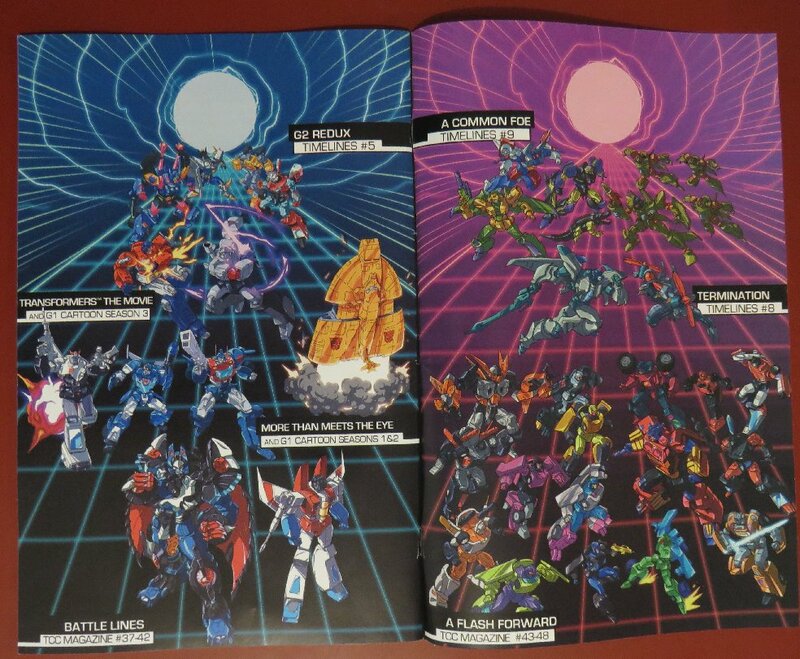 And the fourth poster was also related to their Club Magazine comics from a few years back, with the Transtech theme. 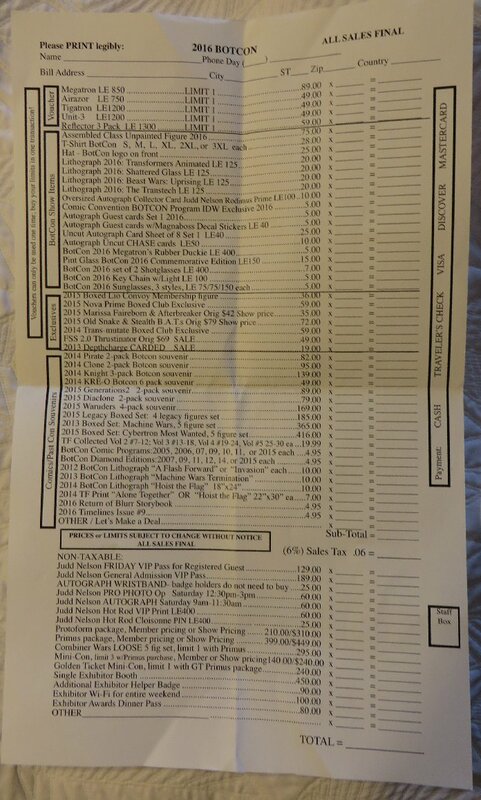 The price list for this year. At the front of the queue. 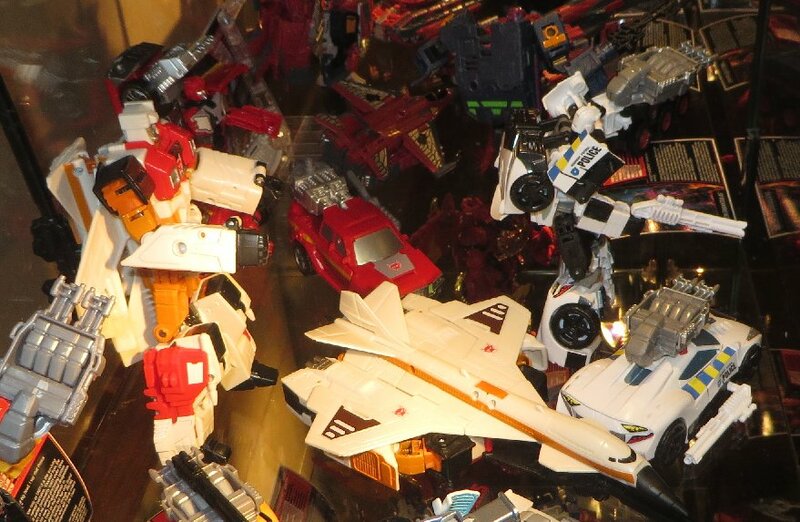 The items, both old and new... a lot of old, with boxsets from the last four years still available, and LOTS of the GIJoe/Transformers toys from last year. 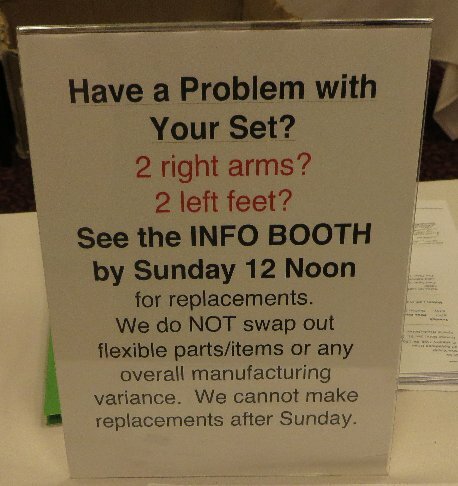 On the table was a map to the dealer room, which would have been useful if I was planning to buy much in the dealer room and needed to fight the crowds to get to certain tables first. 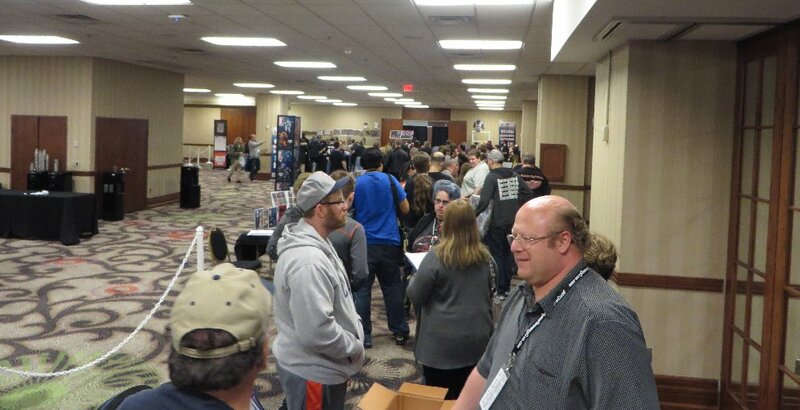 It gives a good idea of the amount of dealers this year, and which people and businesses were there. 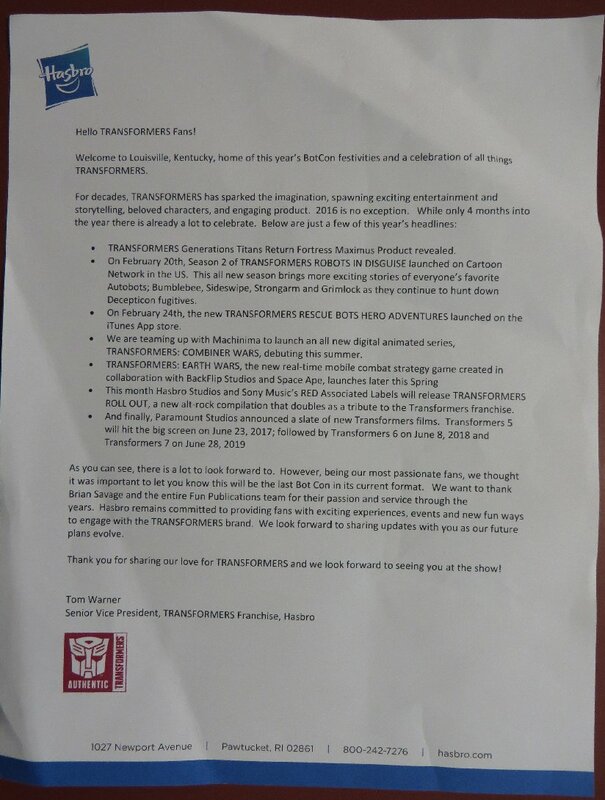 I found a box of Hasbro welcome letters on a table in the main hallway and took one. After reading the first half of it and it sounded like a standard promo press release, I just figured it was something to be handed out to walk-ins on the weekend. It wasn't until several hours later that I heard about the last paragraph making news... and dug out my copy to read the rest. 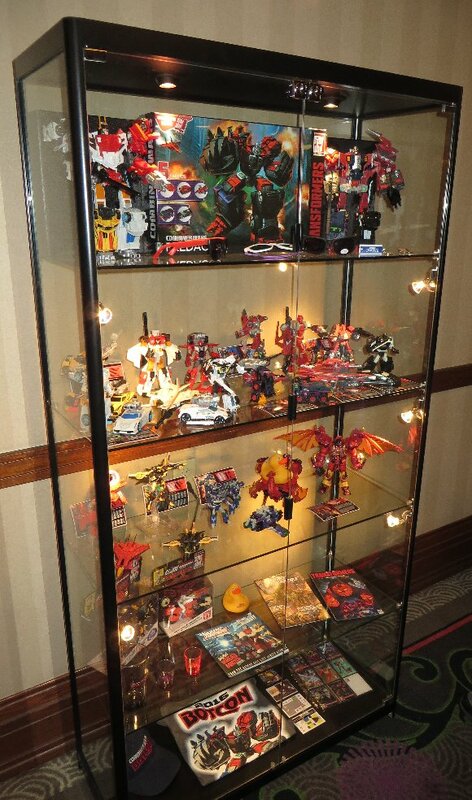 Back at the room at around 6pm, to take photos of my Club Store purchases this year. 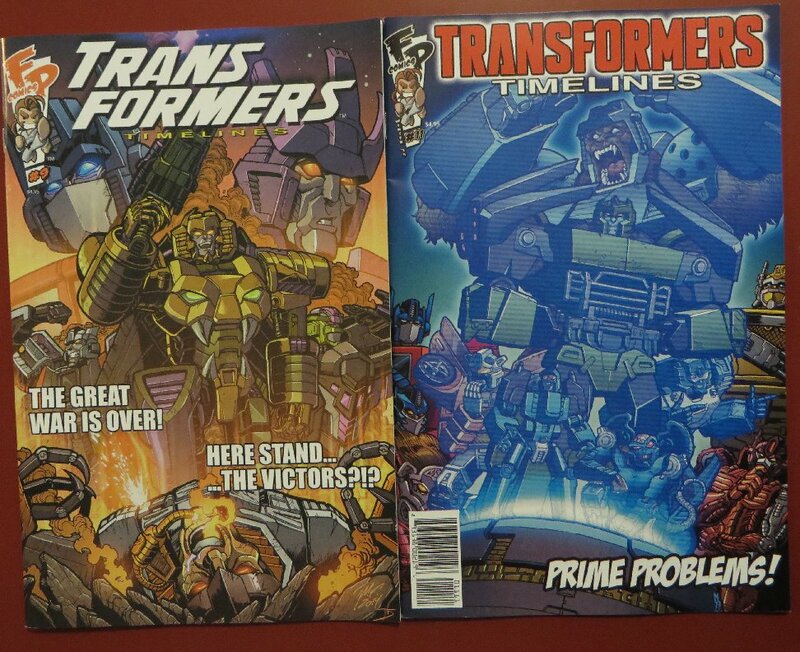 Comics - Timelines #9, BotCon 2016 comic alternate cover, BotCon 2015 Diamond Edition, Blurr Script reading book. 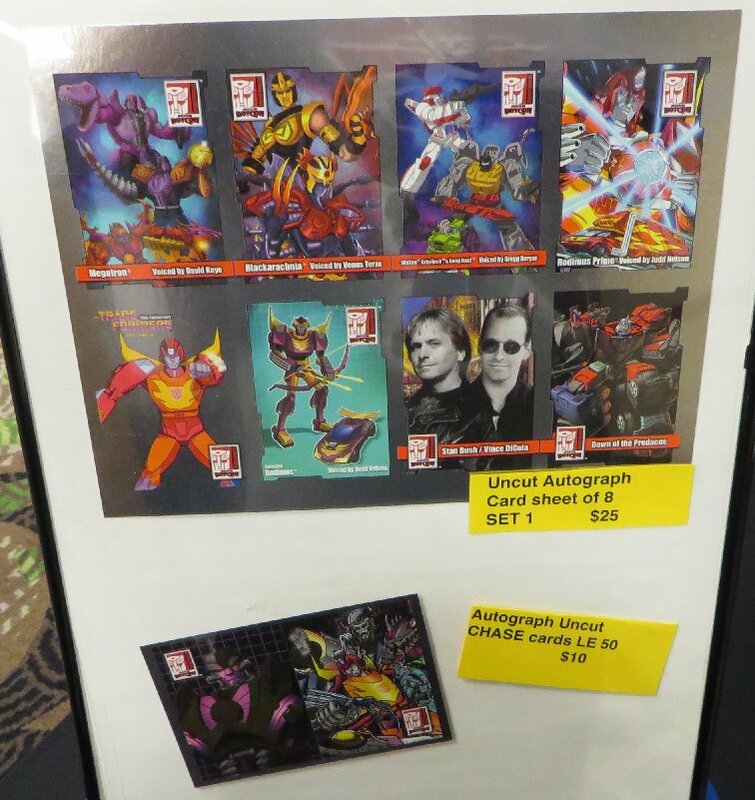 Autograph cards - both sets. 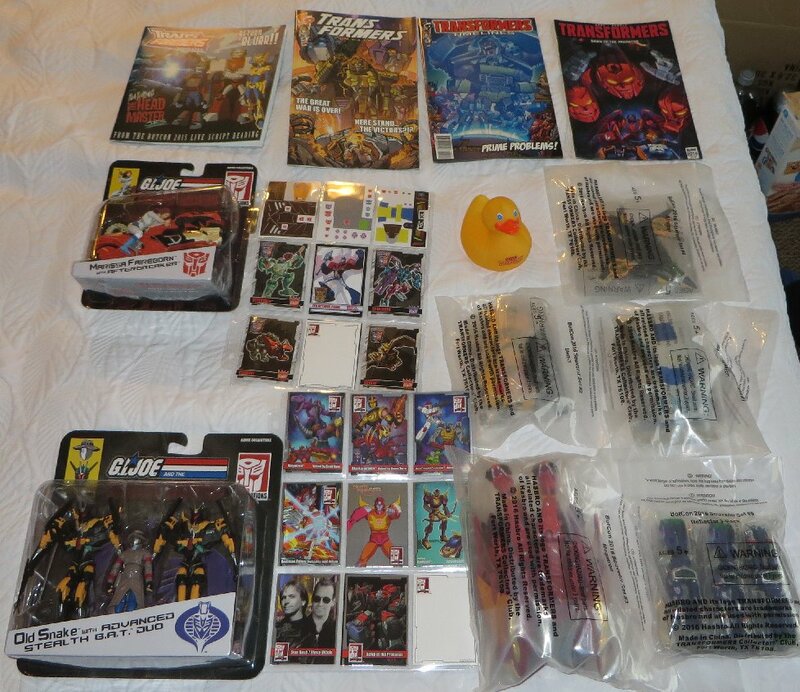 The items I had to buy for the three people who sent me money before I left, which worked out great this year (first time I had done it, as I didn't want this final BotCon spoiled by working out payments and tracking deposits. 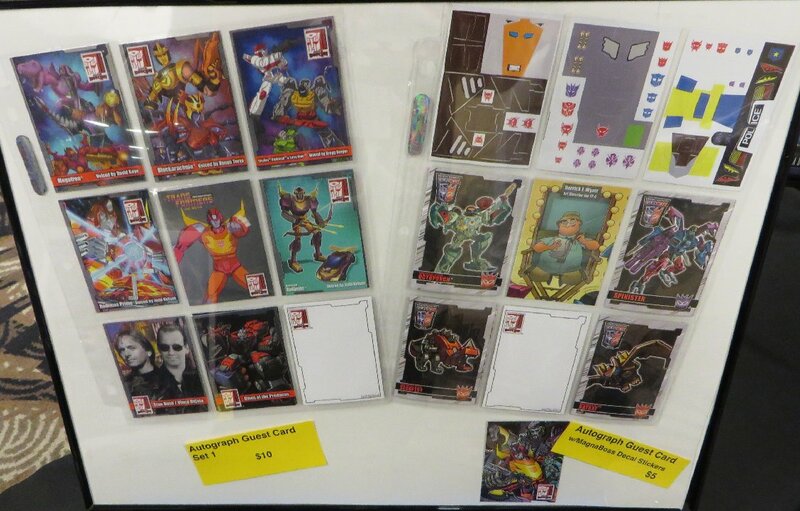 As such, it ended up being quite a small amount this year, which didn't even completely use up my Golden Ticket voucher (I could buy three of each on Thursday), as I could have bought another Megatron and Airazor (if someone had pre-paid me for it). 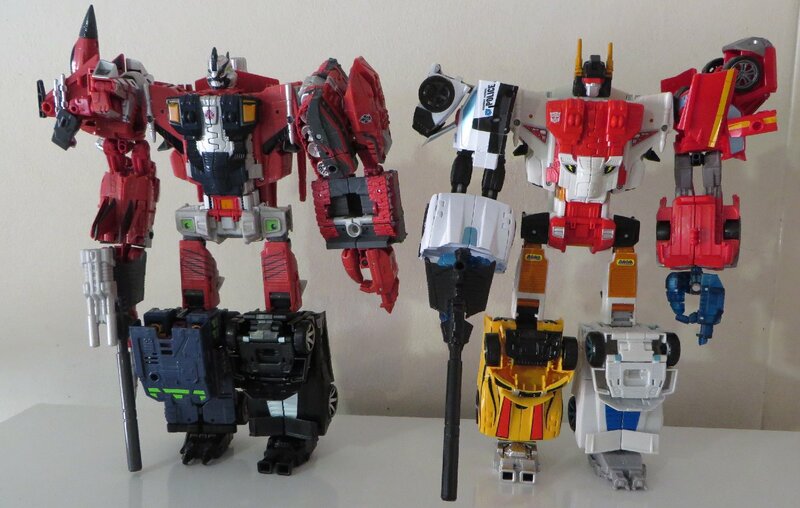 It meant that I didn't need to keep going back to the Club Store later in the weekend, or risk missing out on the items that did end up selling out this year. 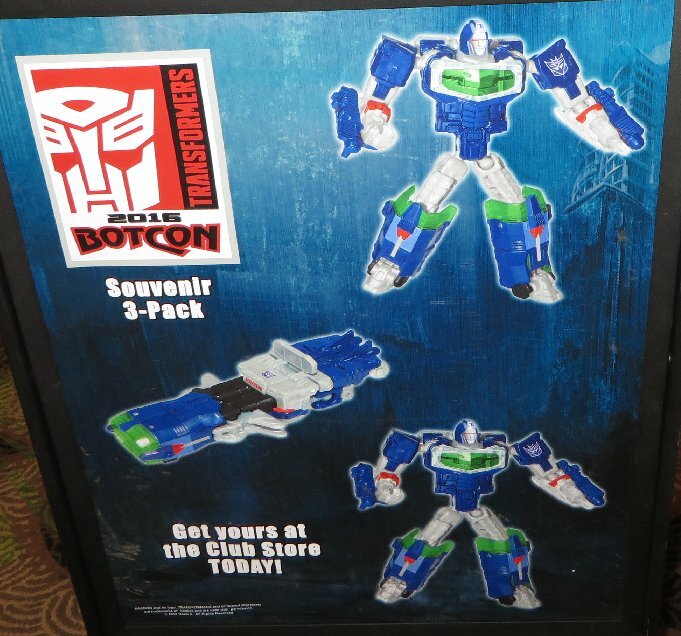 Just imagine how many more sales FunPublications would make from non-attendees who knew an attendee (especially the toys they keep struggling to sell out each year) if they didn't keep two-thirds of them secret. 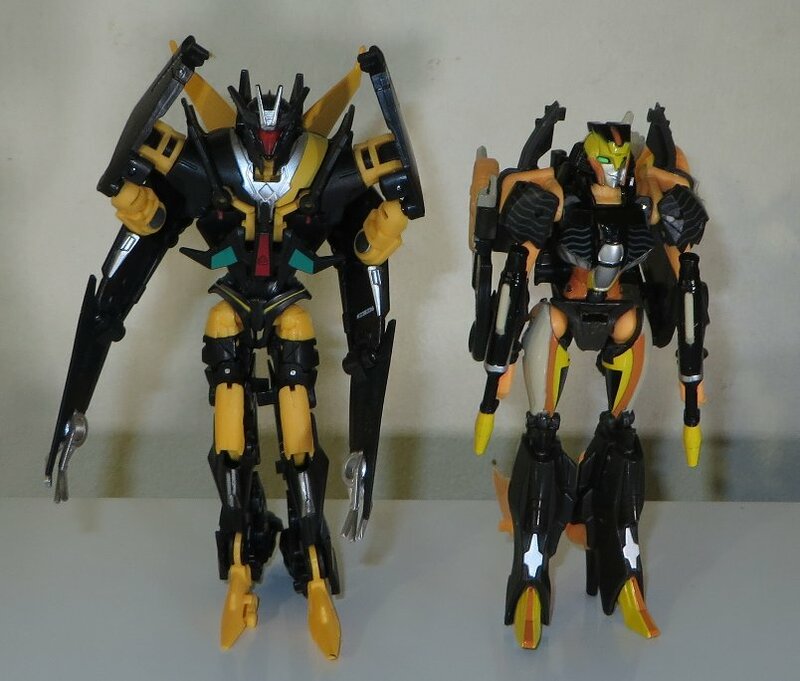 Unfortunately, one of the people who did send me money, wanted two more non-toy items later in the weekend, but they were sold out before I could get back to the Club Store on the Saturday. 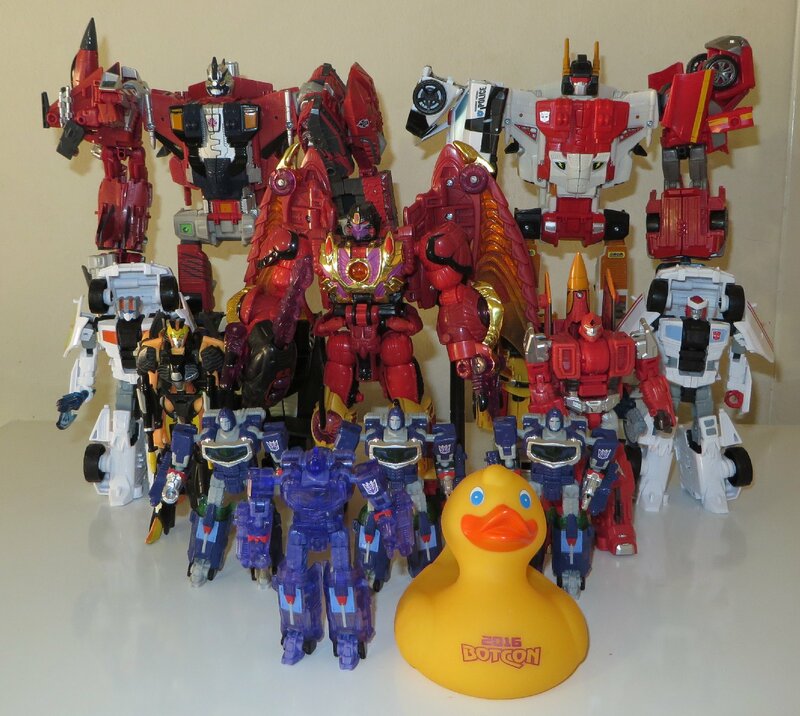 My toys out of packaging. 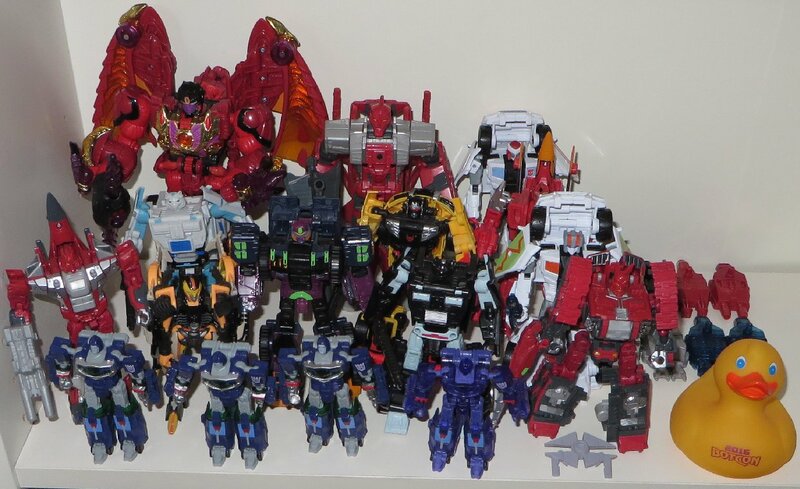 The complete set of BotCon toys for 2016. 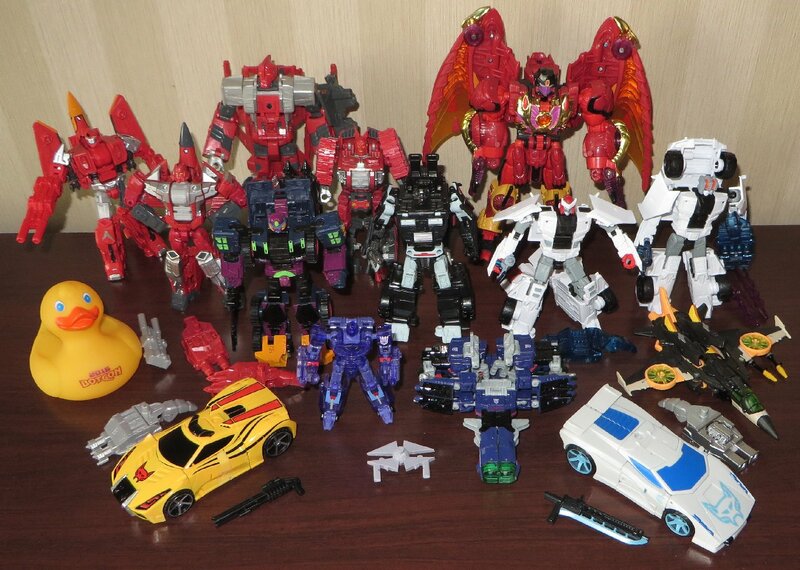 Better photos of the non-toy items. 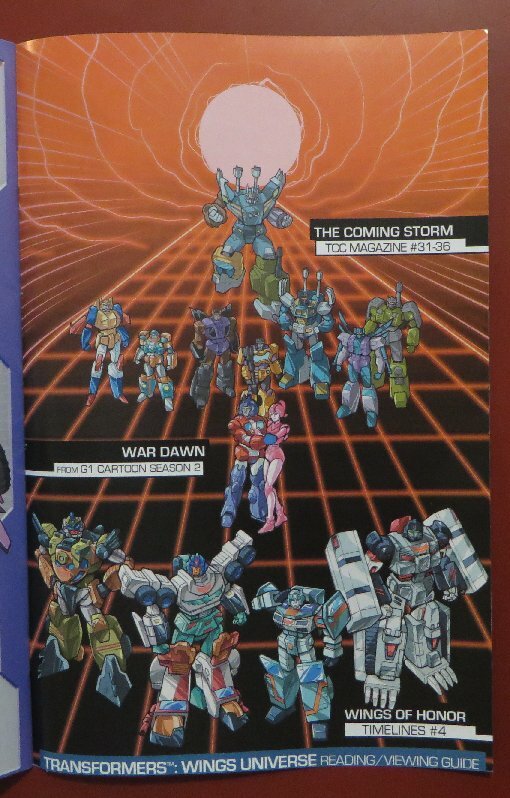 At the back of the Timelines #9 comic was a timeline of events in the Club's universe, for anyone wanting to go back and read through the entire series from the beginning. 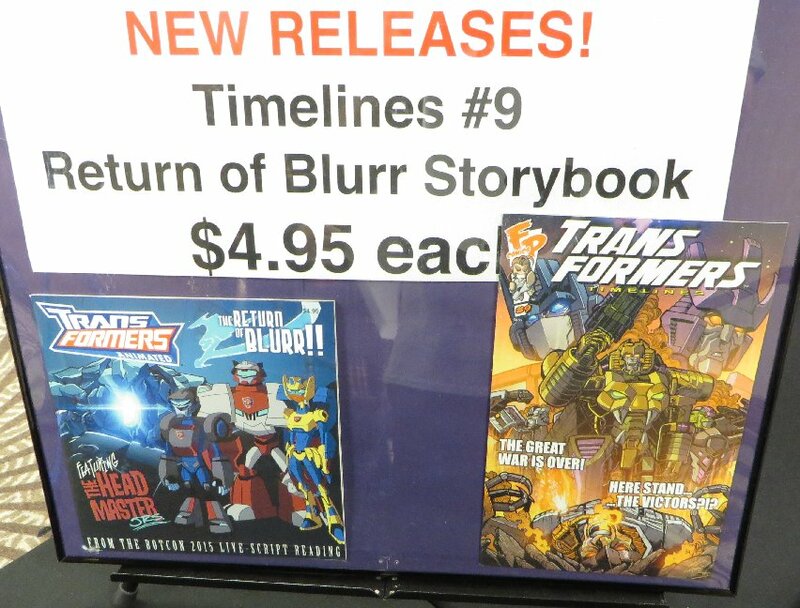 The timeline is from the bottom of each page, working back down the tunnel on each page. 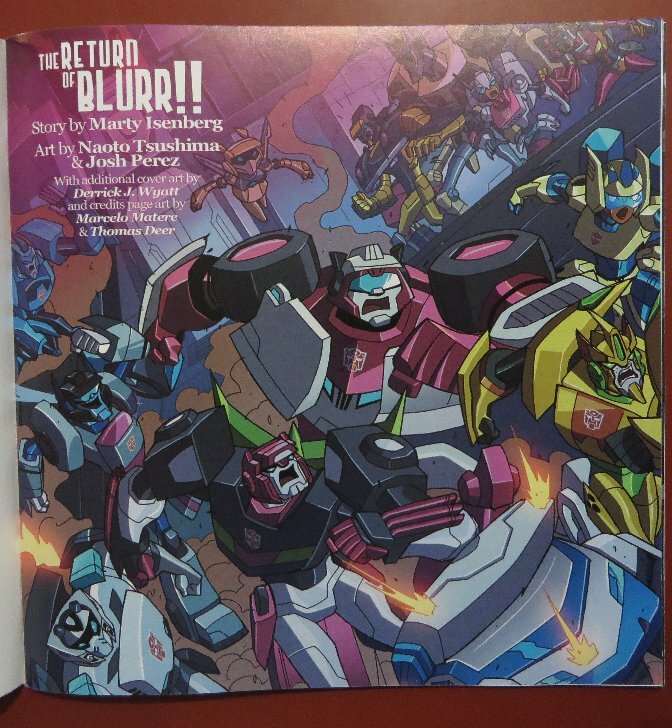 The back cover of the Animated Blurr book, but with the Convention and Club ending suddenly this year, I don't think we will end up seeing the next one, which is likely to be the script reading from this year (on Friday). It had all the images from last year's script reading, with one extra image that is half of one of this year's litho posters. 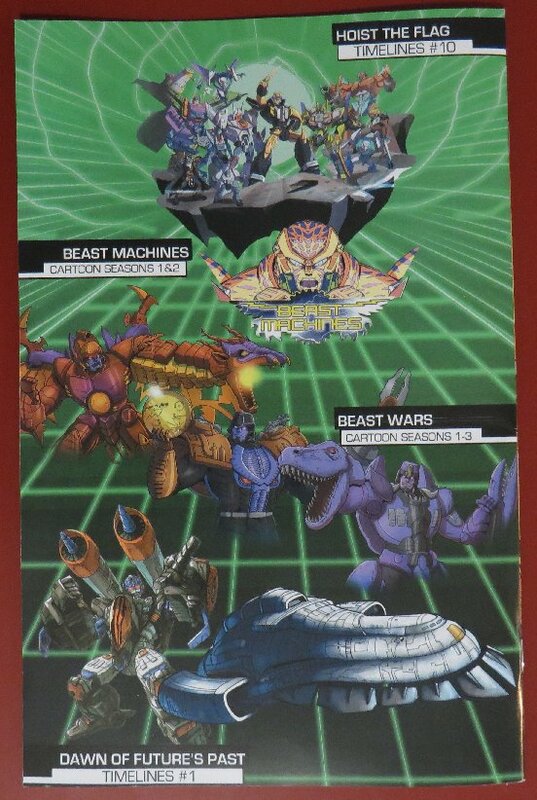 The biocards of the Thursday toys. 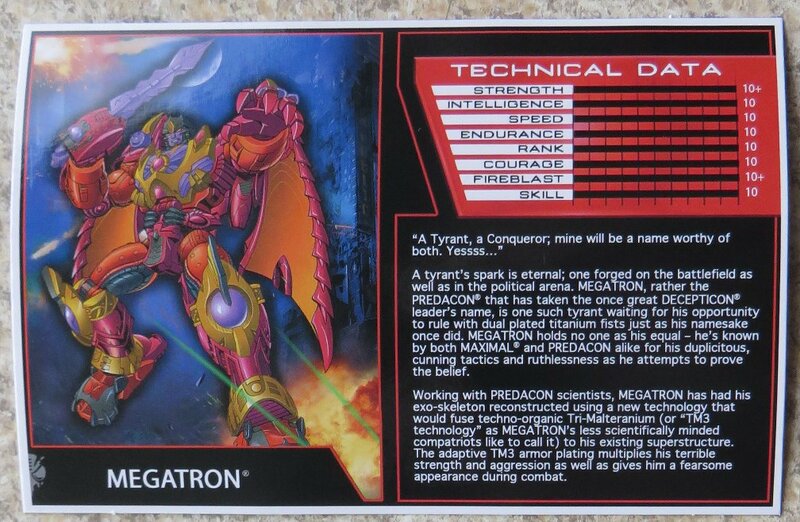 Transmetal Megatron - Hasbro BW, BotCon. 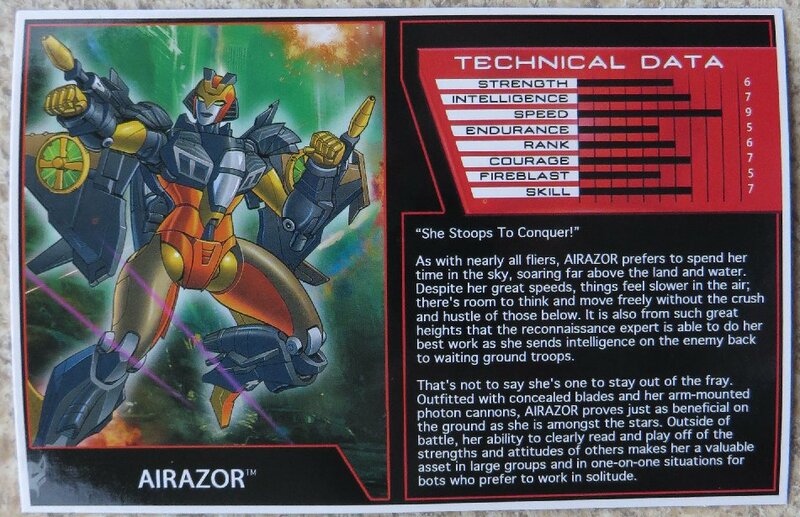 Airazor - Hasbro BW, BotCon, Collector Club. 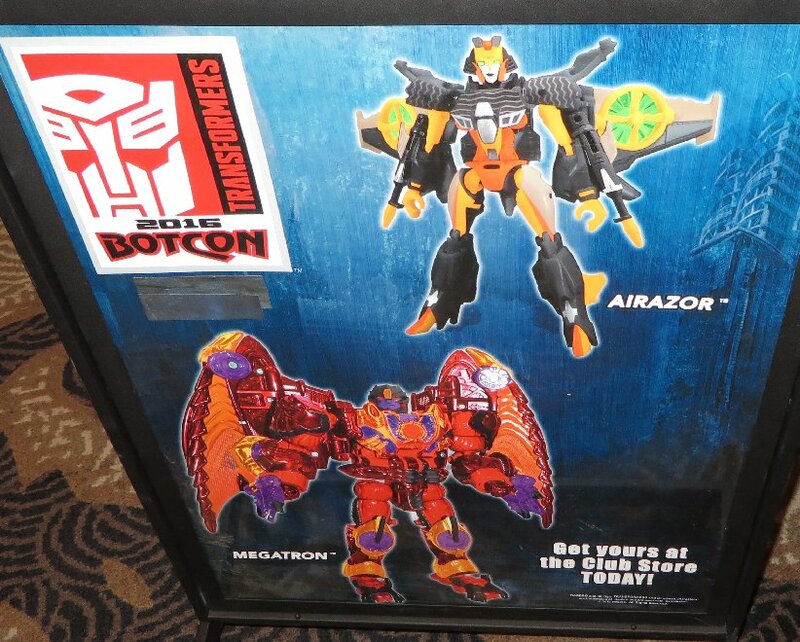 BotCon Airazor with Collector Club BAT, to show it has similar colours to the BAT rather than to the BW Airazor toy or cartoon character. 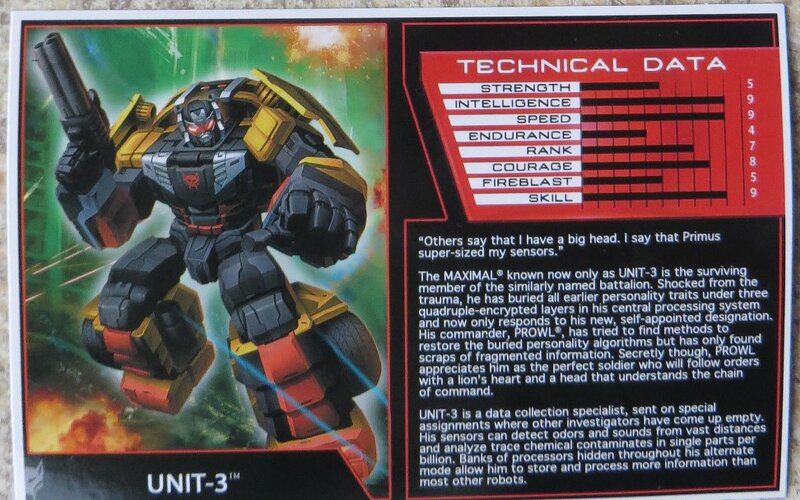 Under 3 - Unit 3. 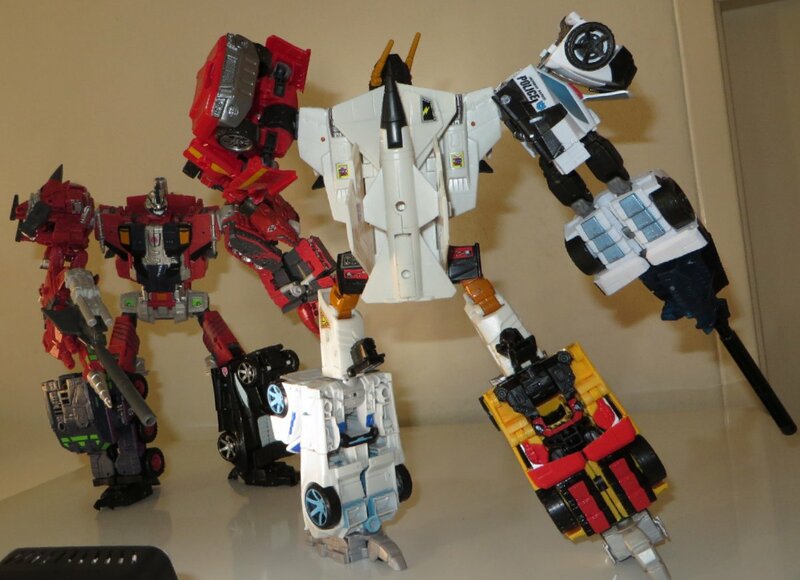 Reflector - Gen1, GEN-14, BotCon (plus Flash Sentry). 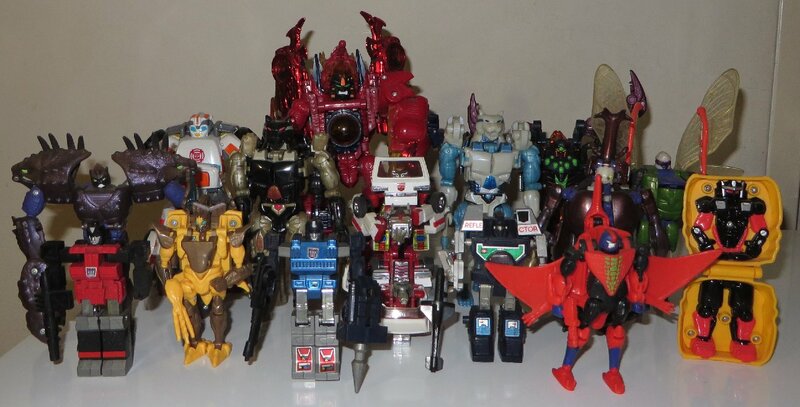 And the actual BotCon 2016 toys in a group shot. 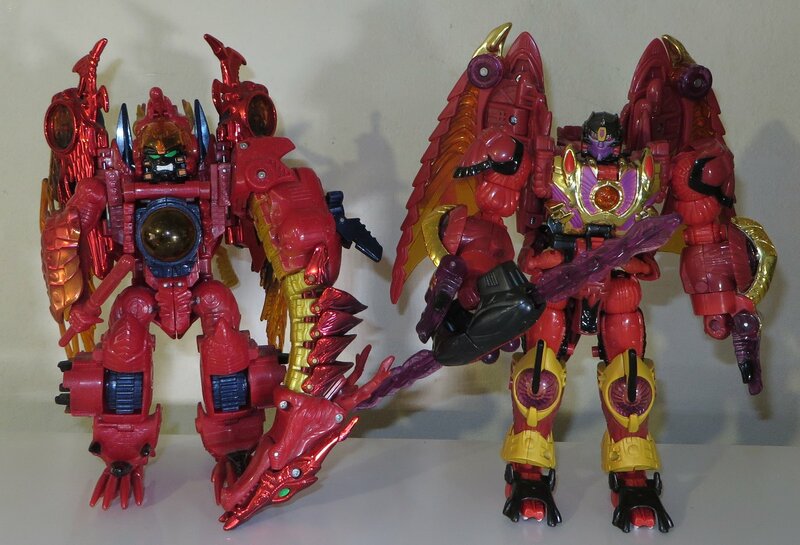 The Predacus in combined mode, with Magnaboss (without the BotCon stickers, as I want to get a second set of Silverbolt, Prowl and Ironhide first). 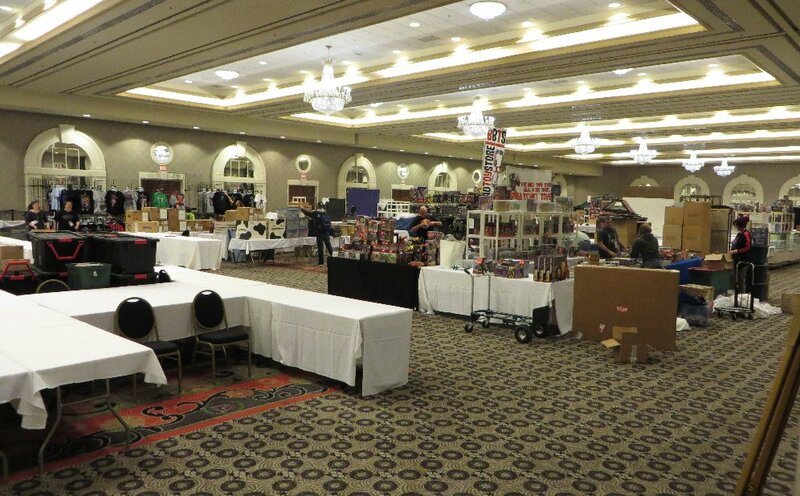 I was in the room until about 9pm with my toys and messageboard, and when it was time for Andy to go to pick up his pack, I headed back down with him, as we considered checking out some trading rooms while we were out. We started out by checking out the room trading noticeboard in the lobby and wrote down some room numbers. 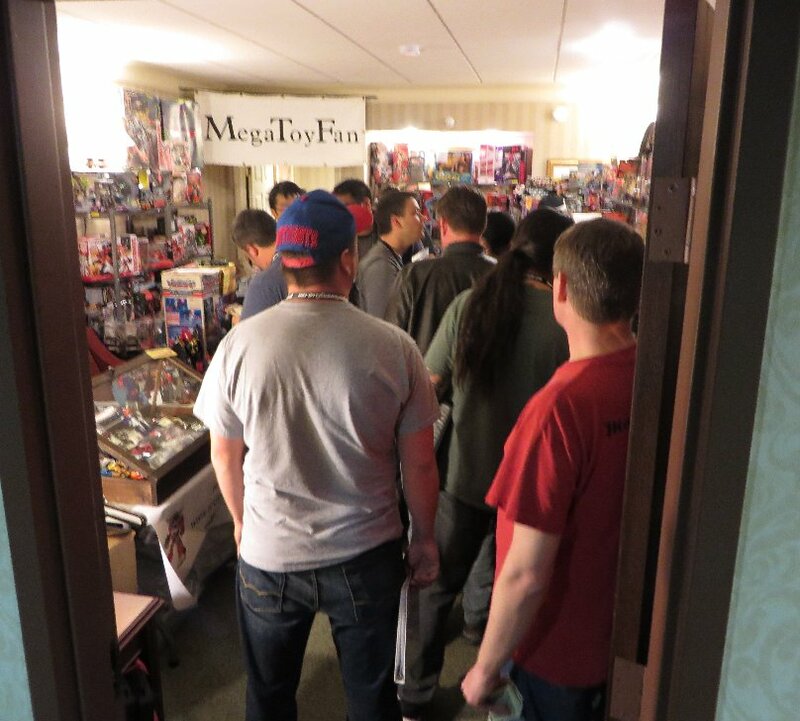 We then headed up to the 2nd floor and saw that there was a really long line of people, as they were still processing the 8pm people... so we decided to go and check out a couple of the trading rooms on the 15th floor of the Suite tower. One ended up being the dealer who wouldn't let me take any photos last year, so no photo again this year, or mention of who they are. 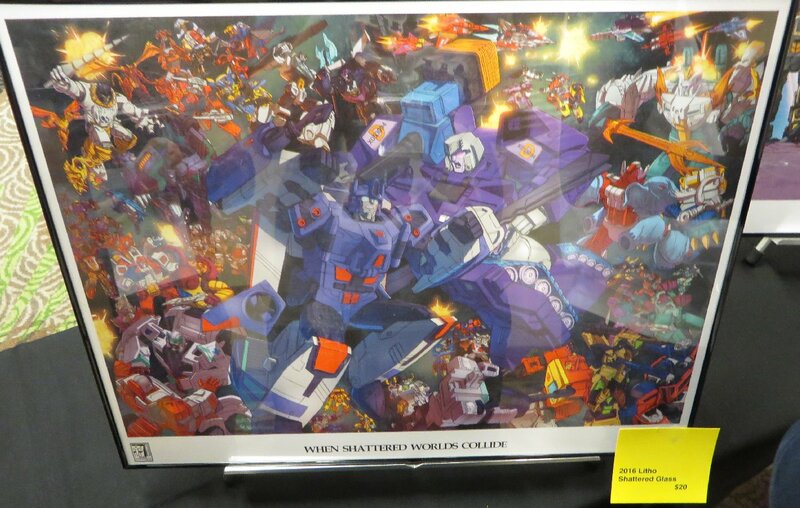 The other dealer we checked out was Mega Toy Fan, and a couple of photos are at the end of this page. Just as it was almost 10pm, I got Andy to head back downstairs, so that he didn't miss out on his boxset and Club Store purchases, on the off chance they had actually caught up. And they had caught up. We got there just on 10pm and there was only about four people left queued up, so while he went in to get his things, I wandered around taking photos of things. 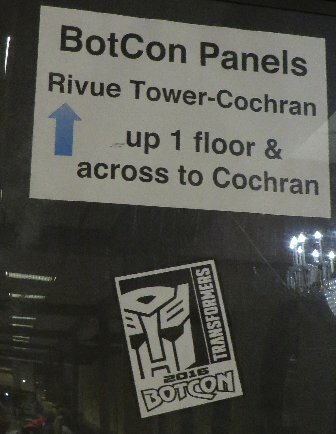 Like some of the signage that was now up. 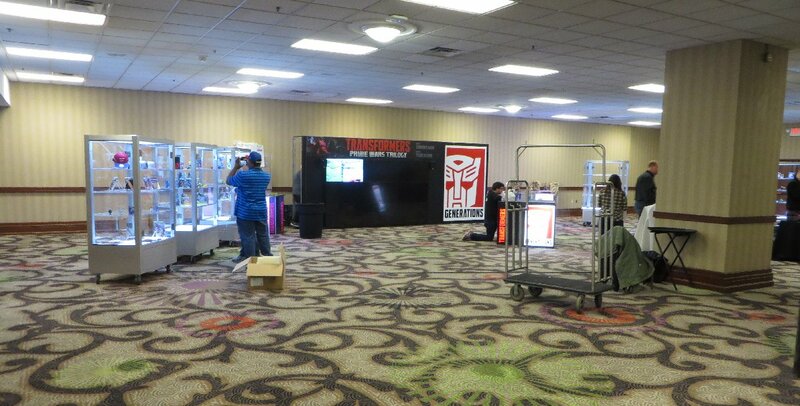 And the doors to the main dealer room were open, so I got a quick look at dealers already setting up for the 2pm opening on Friday. 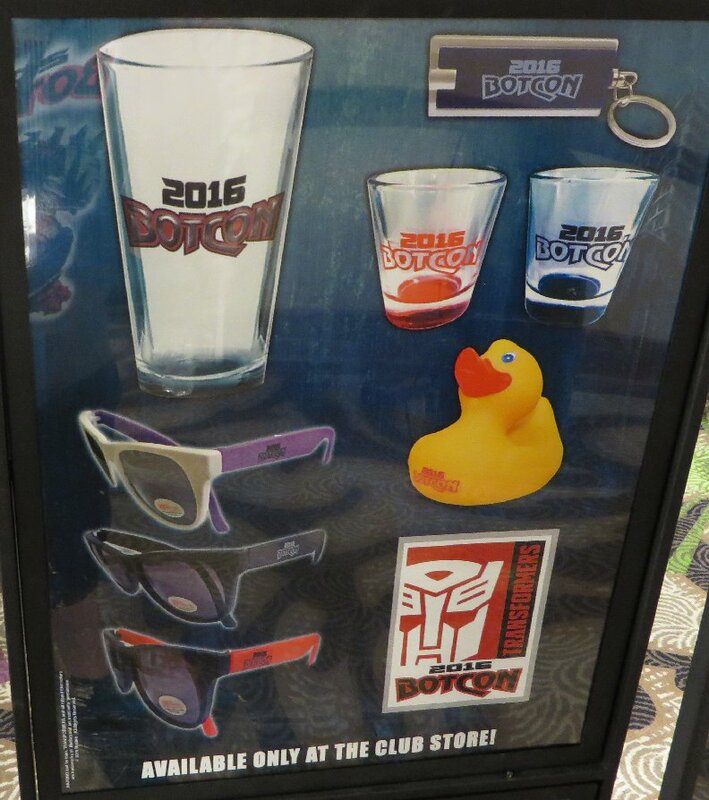 As soon as Andy had his registration pack, we went to the Club Store and lined up for him to make his purchases. 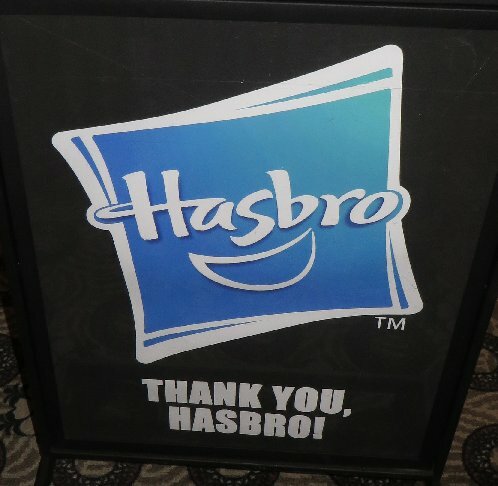 The Hasbro exhibit was now empty as the Hasbro staff look to have finished setting it up. We were at the end of the queue, which was basically the same for me earlier in the night when I went through as a Golden Ticket holder. 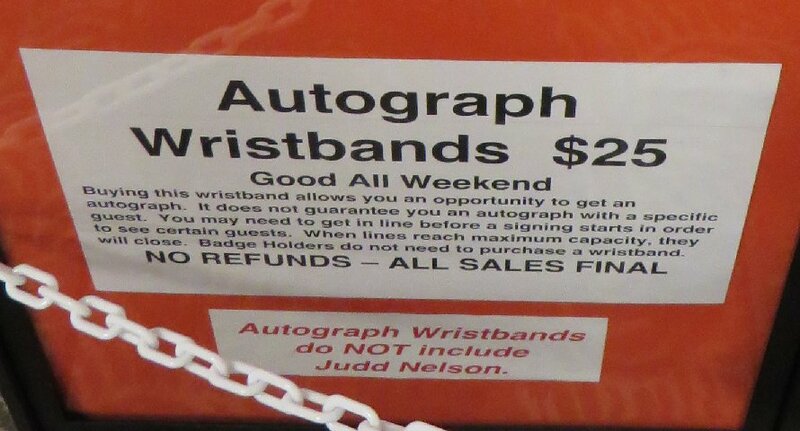 As Andy was buying his things, I took some more photos of things around the Club Store, of the Autograph signage. 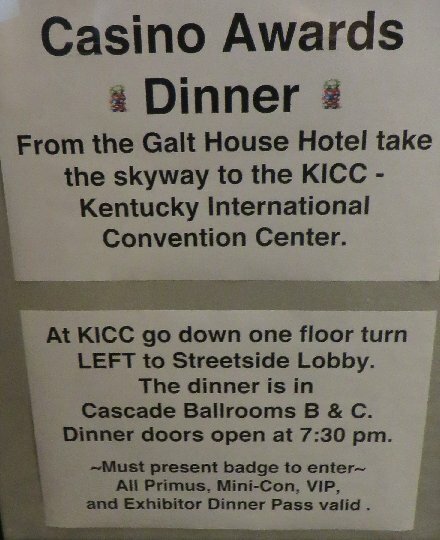 While we were there and were one of the last in the line so as not to hold up things, we talked to one of the staffers about their feelings about the end of the convention and how they first heard about it. 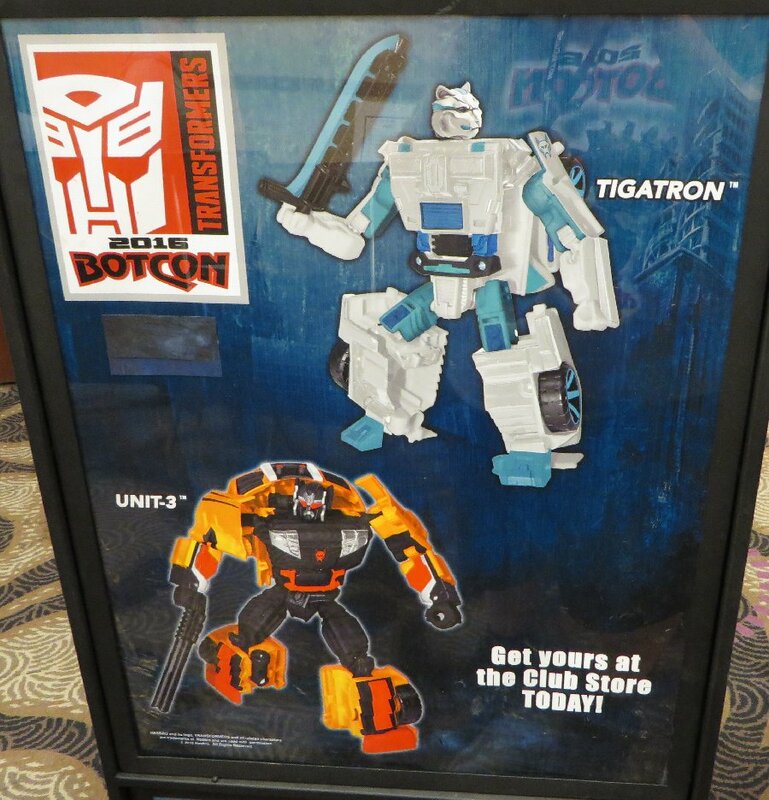 She told us that they weren't given any warning from Hasbro about losing the licenses, as it was apparently just a sudden notification, and it was then passed onto the staff later. 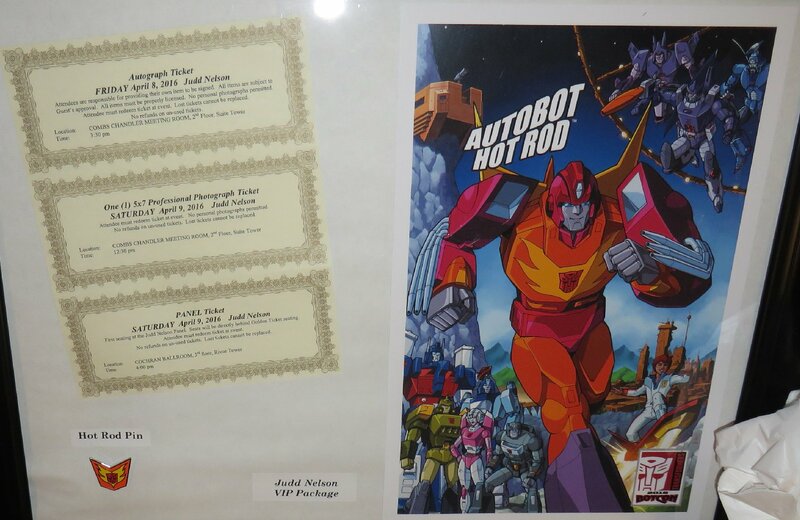 She said that many of the staff, including herself, are going to miss doing the two annual conventions (Transformers & GIJoe), as many of them have had a large part of their life spent on them (like Lanny moving to Texas with his family in 2005 when he was hired to help on the new Transformers licenses), and had some great memories as well (she noted one year having Brian organise a pre-convention staff day to be part of a TV audience for a famous game show). 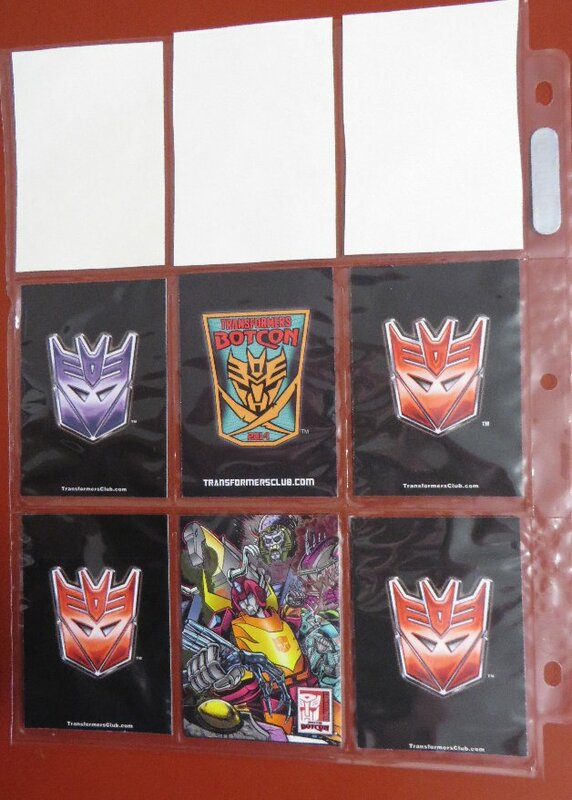 I also asked her when FunPublications or Brian did their first GIJoe convention (to get an idea about how long they were doing them before they took on Transformers, because I couldn't find anything online), and she said 1997 was their first GIJoe themed convention, which makes it even sadder for them to have to end their 18 year run of that convention. 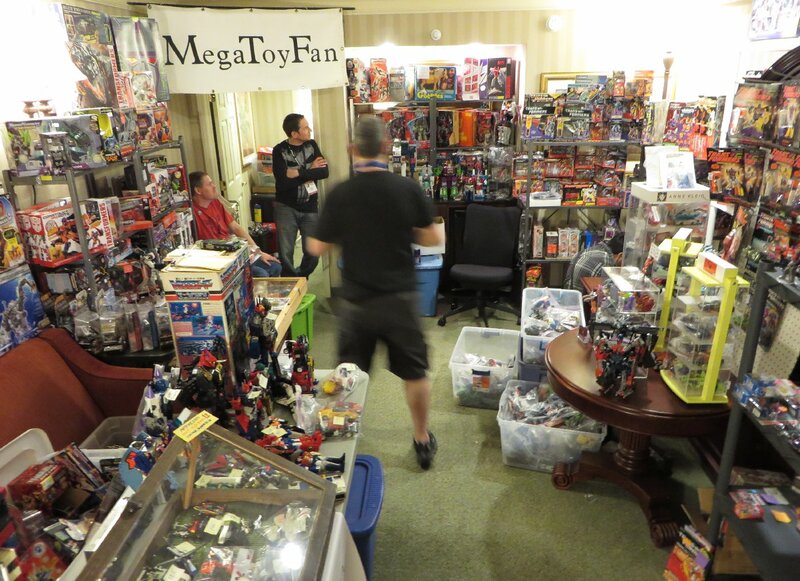 We took Andy's toys back to the room and headed back to the MegaToyFan room in the other tower. It was already 10.45pm so we weren't sure if they would still be open, but sure enough, they were, and there was a crowd (the first photo was from 9.30pm, the second photo was at 11pm). We got back to our room a bit before 11.30pm, and after a few more hours on the computer and talking, it was 3.30am, and I was off to sleep. It was a big day today and the main convention hadn't even started yet. 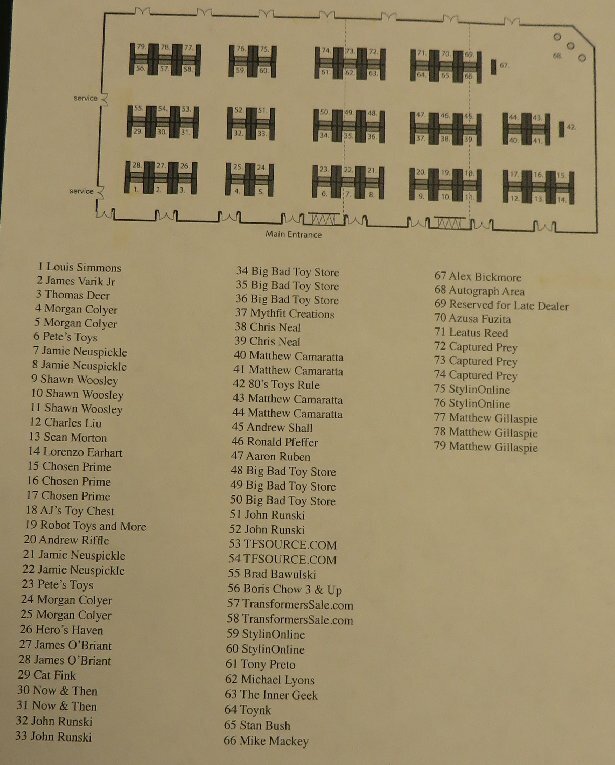 It was also nice to start seeing various notable people around the place, just stumbling across them randomly around the place like regular people, including Derrick Wyatt, Jim Sorenson, Frank Todaro.